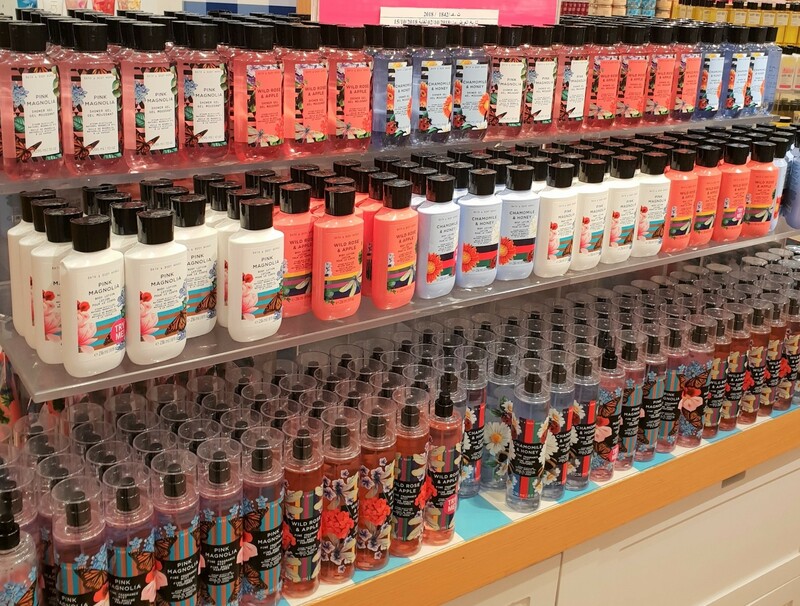 Raise your hand if you like Bath & Body Works! I do! I do! I do~oo! 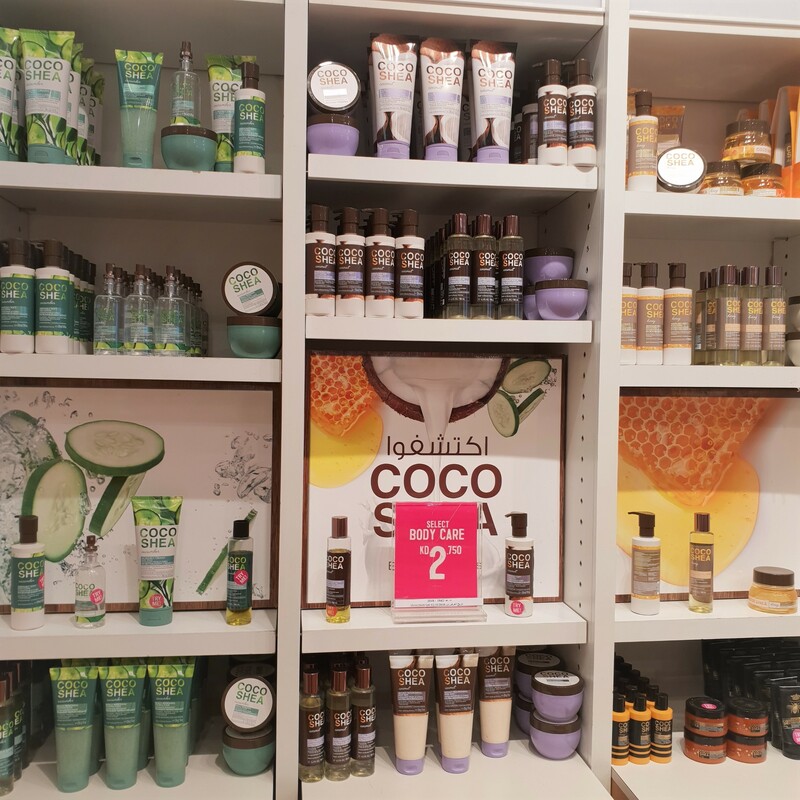 Whenever I find myself at the Avenues Mall, I always make it a point, to hit up Bath & Body Works (facing Carrefour Supermarket). 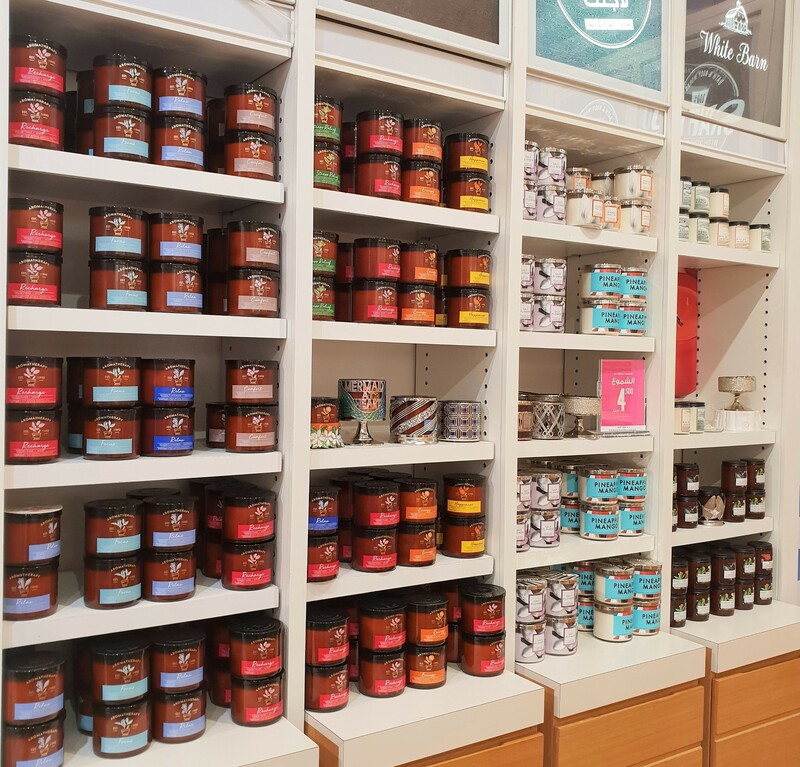 From the moment they opened up their first store in the country (here), I’ve been obsessed with Bath & Body Works (they actually retweeted my earliest hauls lol)! I believe I was around 24-25 years old back then and even now as a 33 year old, I’m still just as obsessed with the store! 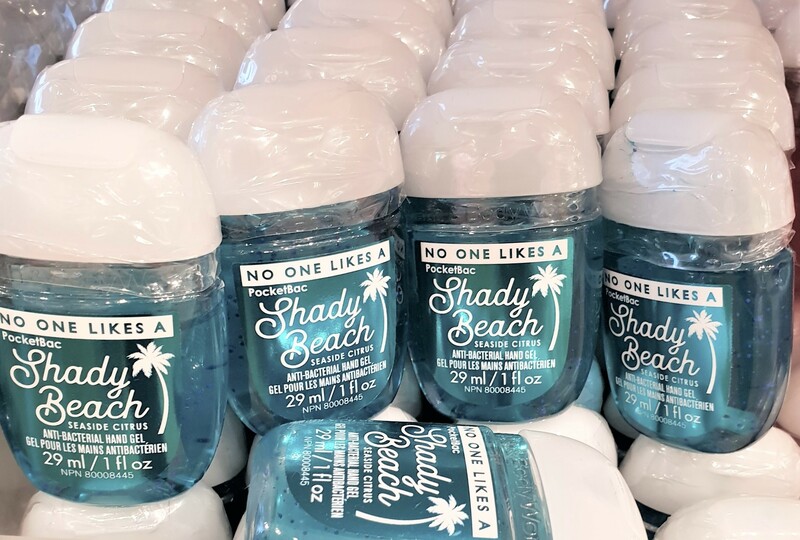 From the sublime beach-y scents (variations of coconut and mango and other exotic fruits that instantly transport you to a tropical island) during Summer, to the divine holiday scents (including the cult-fave Vanilla Bean Noel which was vanilla… on steroids) during Winter! 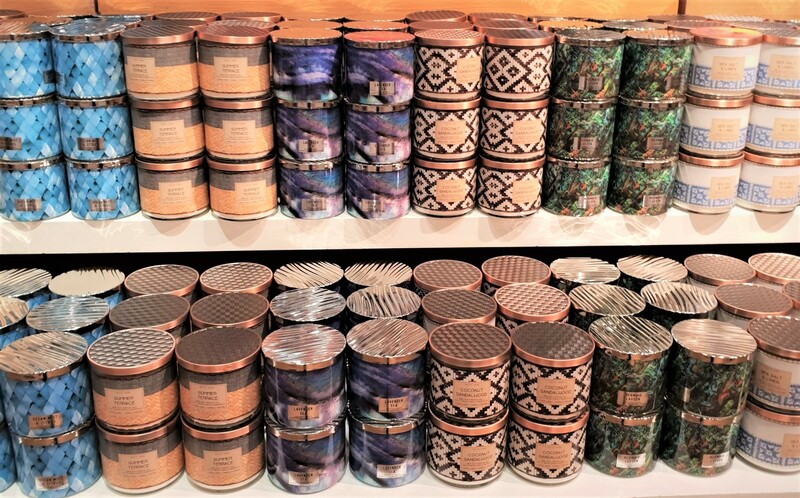 From the delightfully delectable gourmand scents (encompassing macarons and gelato and lemon-y desserts and everything in-between) during Spring, to the intoxicating heady spicy scents (cinnamon and pumpkin everything) during Fall/Autumn! 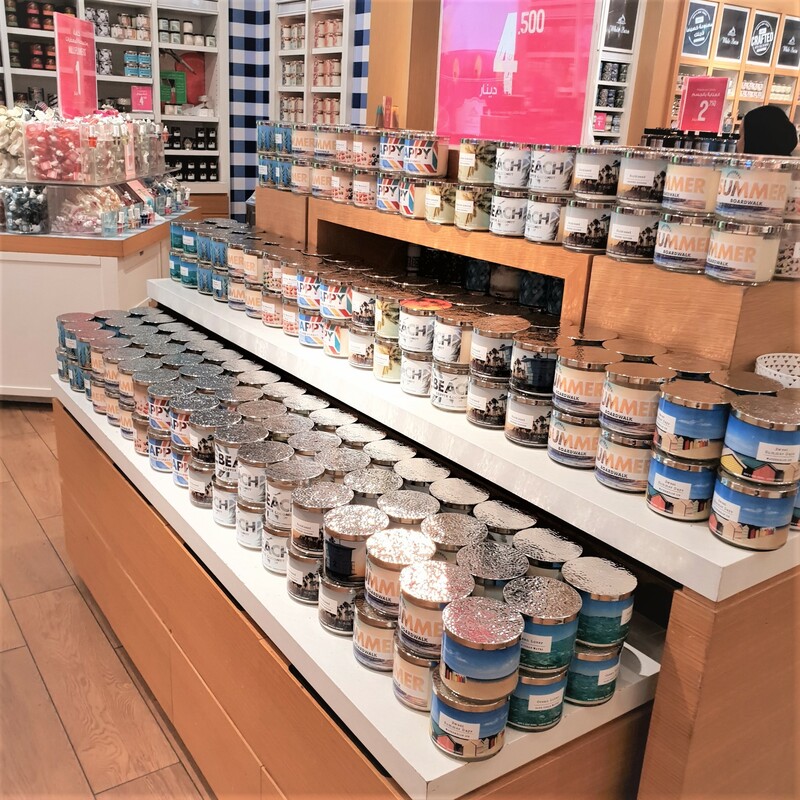 To me, nothing highlights the changing of seasons, quite like the seasonally appropriate Bath & Body Works Collections! 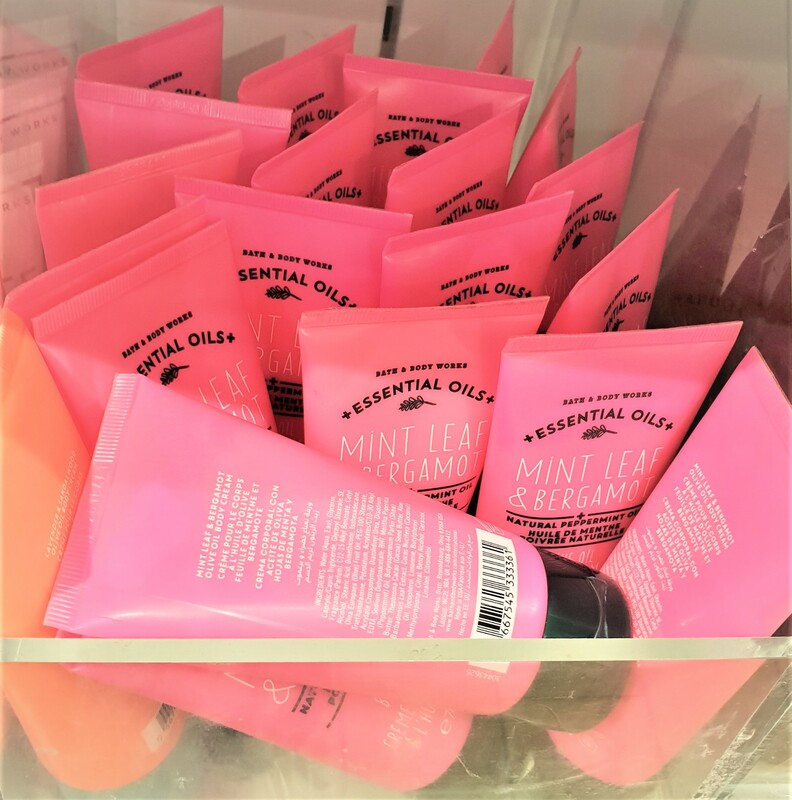 Whether you enjoy scented candles or scented shower gels or scented body lotions, they’ve probably got a scent (or twenty) that you’d enjoy! They even carry unscented body lotions! 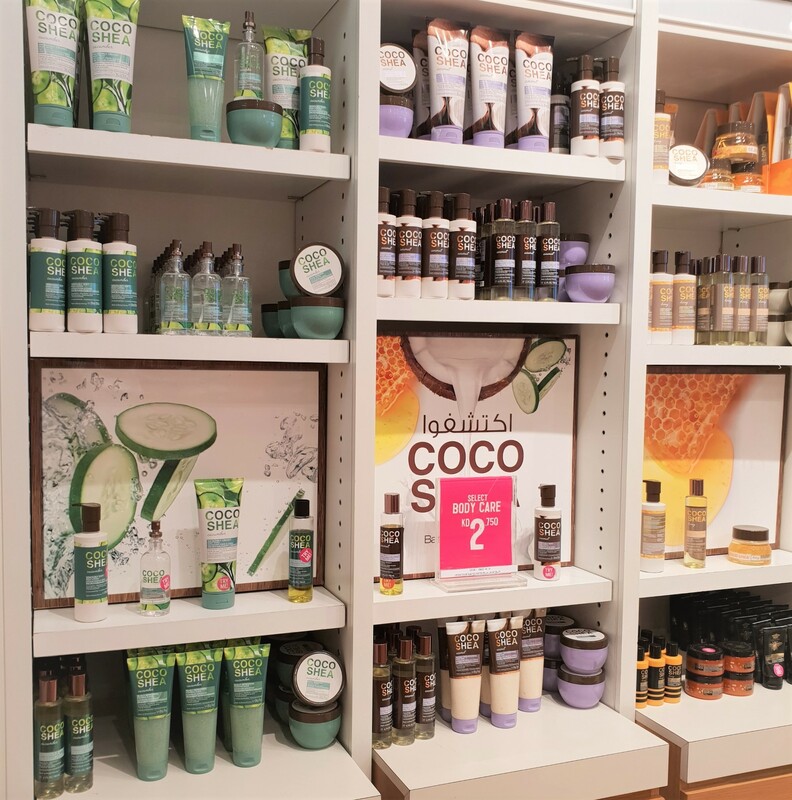 It goes without saying, but they also offer everything fragrance-related, that you can think of! 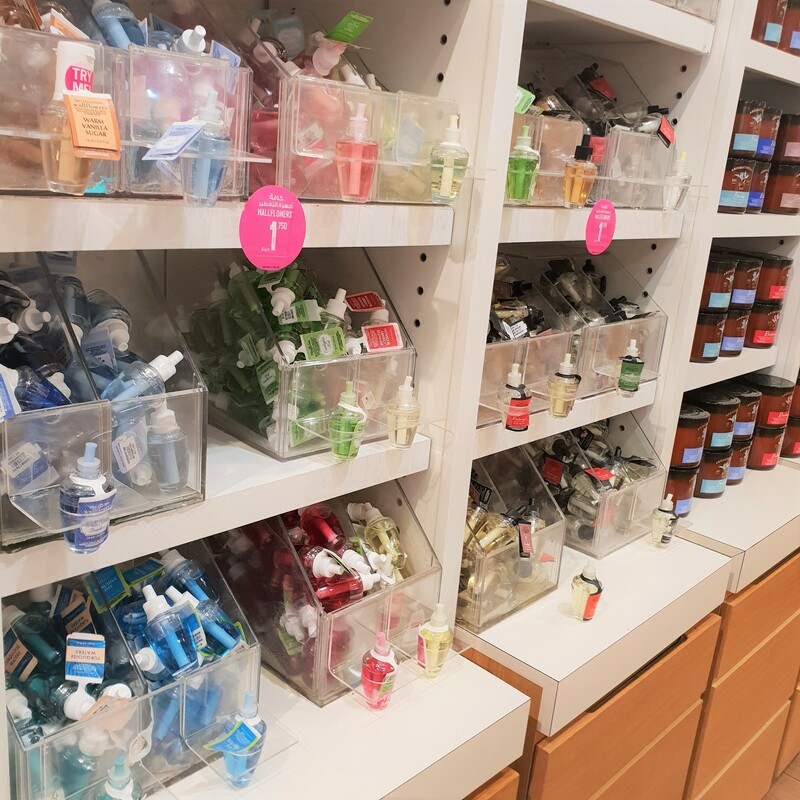 From perfumes and cologne to fine fragrance mists (less potent versions of their perfumes and cologne), to room sprays and wallflowers (electric plug-ins), they’ve got it all! 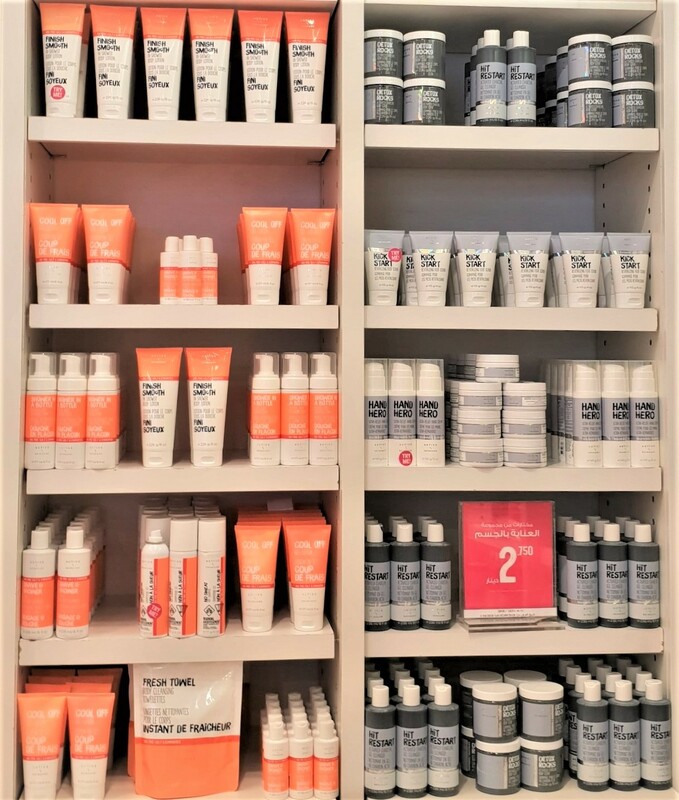 In addition to the variety of different moisturizers (body lotion and body cream and now, body butter and body oil), they seem to have branched out into skincare (face mists and face scrubs and now, sheet masks) and hair care (from 2-in-1 hair and body wash to dry shampoo to sea salt mists)! 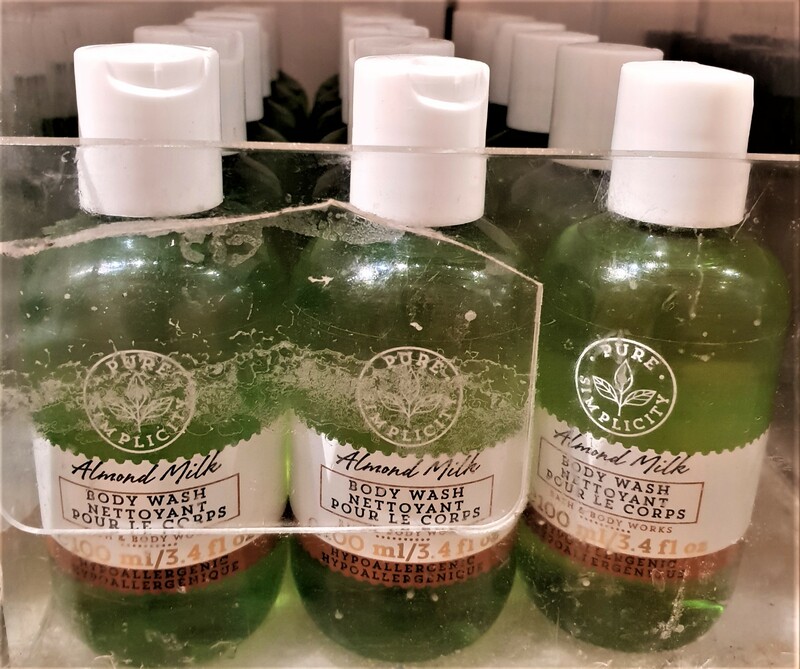 Over the years, I grew dependent on their cleansers (from body wash to shower gels to body scrubs to hand soaps to antibacterial hand sanitizers aka pocketbacs)! 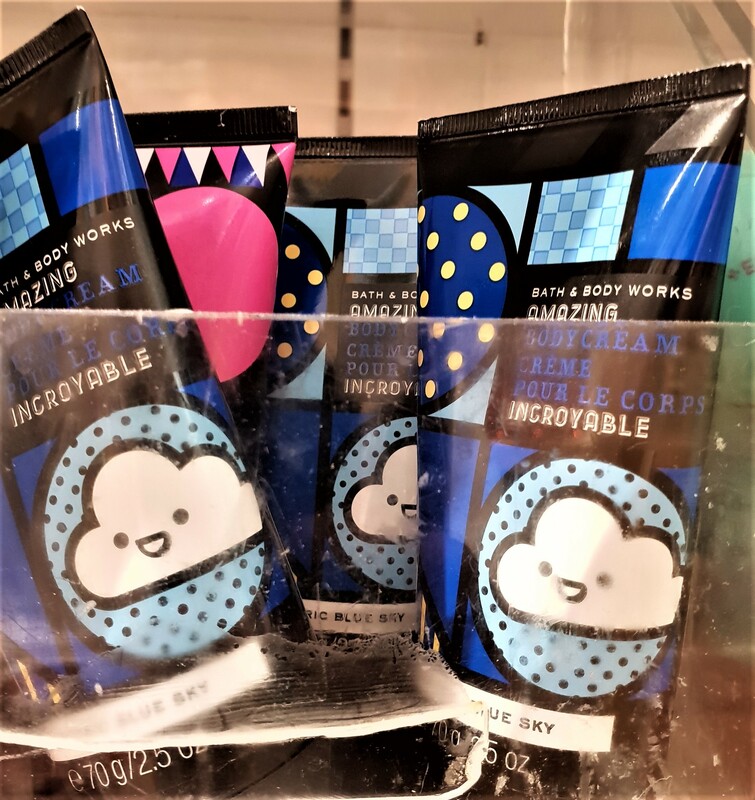 They even had all kinds of awesome lip stuff (from gloss that goes on clear and changes to pink after reacting with the natural pH of your skin to balms that are impossibly emollient and creamy), all of which tasted just as great as their smell! 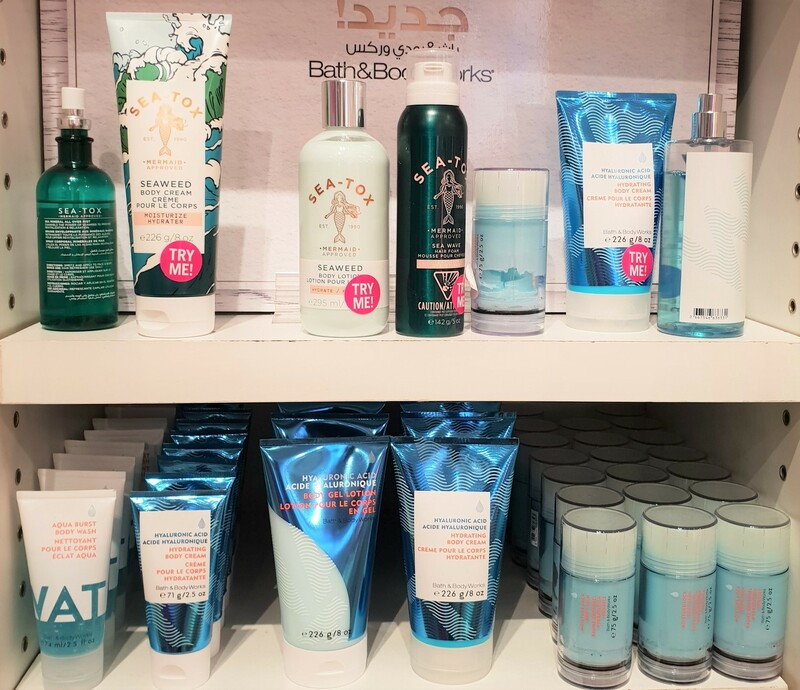 Best of all, Bath & Body Works are continuously keeping up with the latest trends (the trend du jour seems to be Hyaluronic Acid), but they’ve also got a fitness line called “Active On-The-Go Collection” and even came out with a Mermaid-Inspired Sea-Tox Collection and a Crystal-Inspired Mineral Co. Collection and Zodiac Astrology Candles earlier in the year! 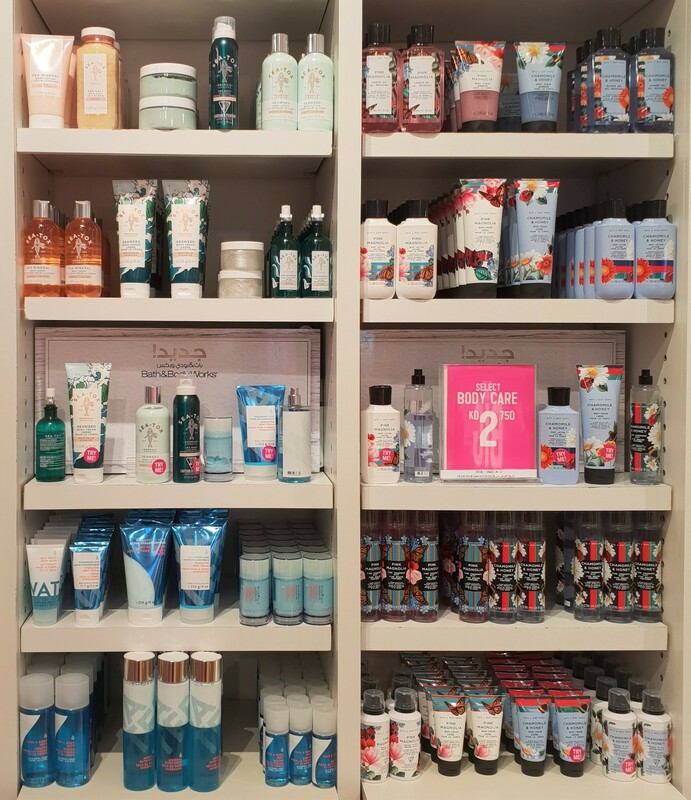 Unfortunately, a lot of Bath & Body Works Collections are usually missing several items. Heck, some of those collections never even make the jump to Kuwait! I haven’t seen any of the Halloween Collections in a minute. The ones that do make it, always appear 2 months (if not more) later than the rest of the world (which is kinda’ inconvenient). It means we don’t get our hands on the latest summer collection only until after we’ve gotten back from our actual summer vacation lol Once they finally arrive (sometimes missing several of the “star” items of the collection), the newer collections are almost always excluded from any promotions! There’s usually a Buy 2 Get 1 Free on the latest collection, BUT you can’t mix-and-match (meaning you can’t get 2 items from the newest collection and 1 from the older collections, all three have be from the latest collection or all three have to be from one of the older collections) which I find… petty. We should be able to mix-and-match from both the newer collections and older collections (at least that’s what I believe). Mostly though, I hate how they package the previous Holiday Collection (have a whole display for it and everything) passing it off as “newly arrived”, about a year too late! Also, over the years, their scented candles seem to have become less… fragrant (watered down). Back in the day, my beloved Cotton Candy Candle (haulage here), used to scent up an entire room (without ever being lit)! The more recent ones barely form a scent bubble around the candle itself (even after being lit for 2+ hours)! It’s also kinda’ annoying not being able to find wallflowers other than the 6-7 from the signature line (some stores had none)! To their credit, they now stock all the stores with a variety of wallflowers! Meanwhile, the more recent Hand Soaps smell rank (from being stored in the heat maybe? I dunno’, just guessin’)! 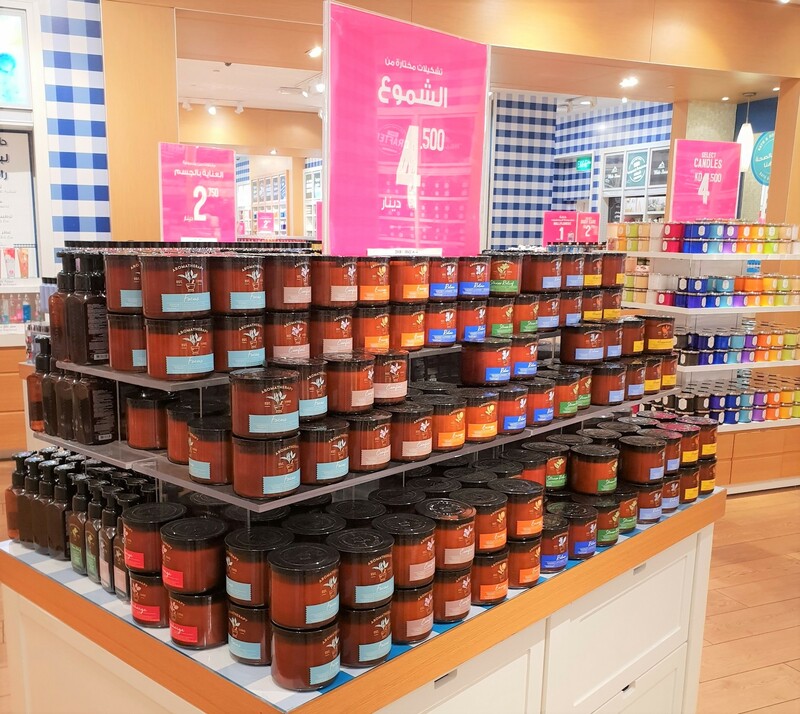 All those things upset me enough, that I swore off Bath & Body Works for months and months, and even started looking for alternatives! Also, I hate how a lot of the stuff always looks so ratchet (despite being completely new)! People shouldn’t be allowed to paw at everything! That’s what testers are for! I’m sick of buying “new” stuff that’s clearly been sampled beforehand! Other than being straight up gross and unsanitary, it also shortens the shelf-life of the product (making it expire even faster, after being opened and exposed to air for God knows how long). You can find a lot of the destroyed ones in most branches year-round, but they bring out all the un-salvageable ones out during their “Big Sale”. 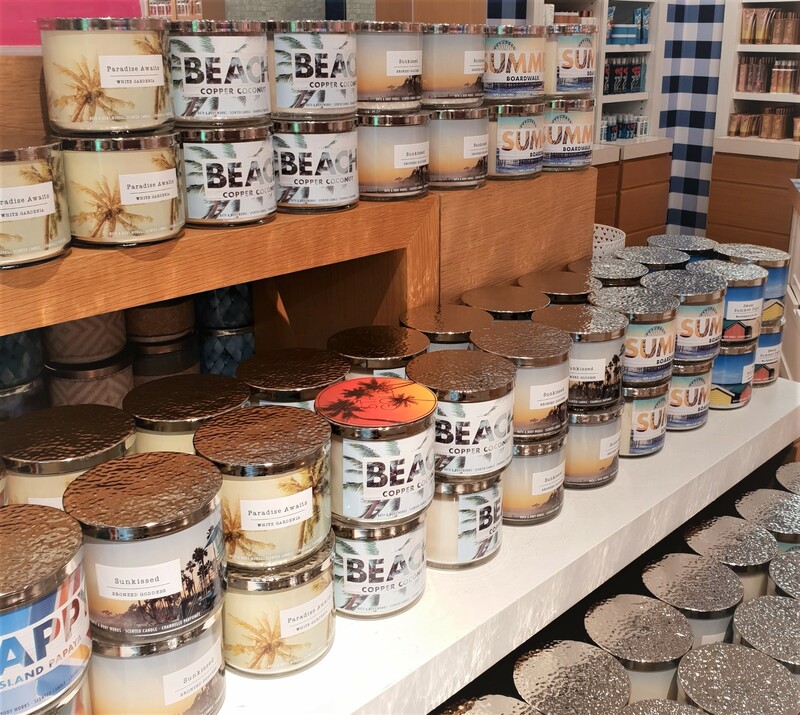 To top it all off, everything at Bath & Body Works is ridiculously overpriced! 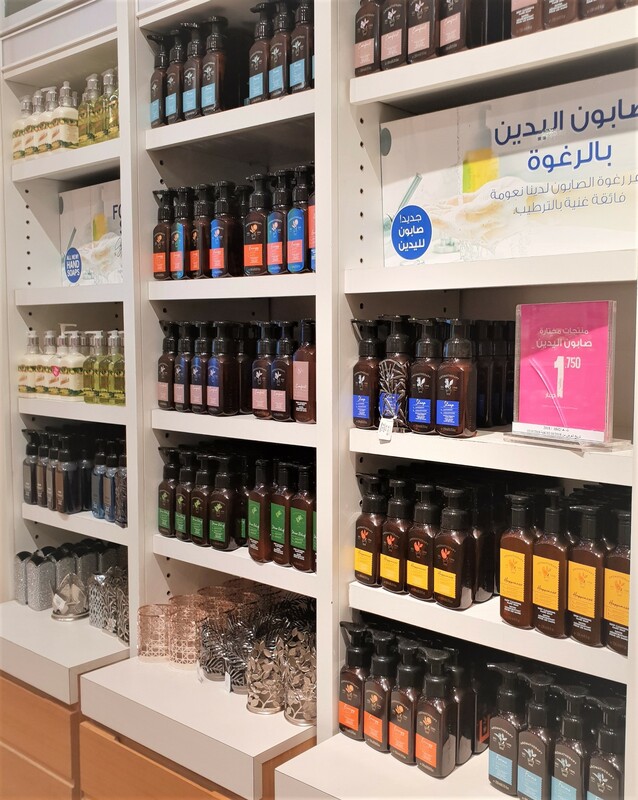 For example, the Hand Soaps retail for $6.50 (KD 2) abroad, but are usually on sale for $3 (KD 0/910) abroad. That’s less than 1 Kuwait Dinar! In Kuwait they usually retail from KD 3/500 ($11.51) to KD 3/000 ($9.86) depending on which branch. That’s almost double the actual price! 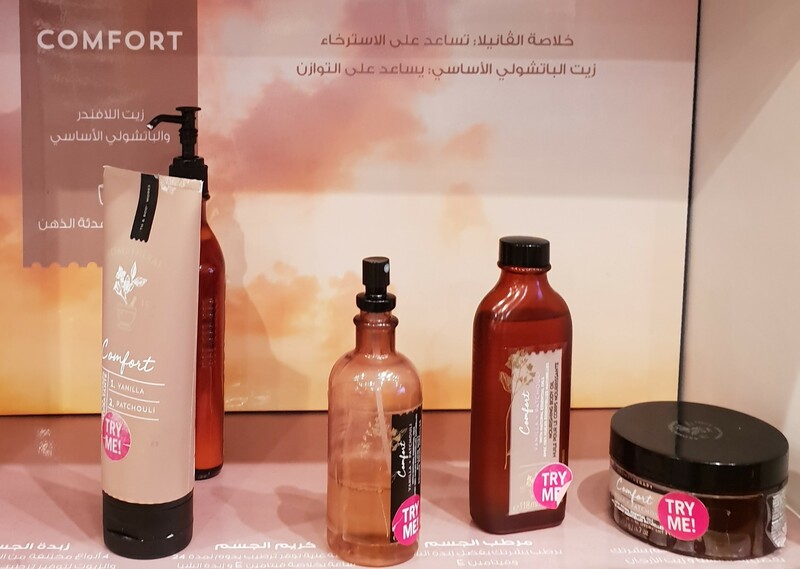 Only during their “Big Sale” can you pick up the unwanted scents (the ones that didn’t sell) for KD1 ($3.29) which is closer to their actual price abroad (they’re always on sale abroad and they’ve always got deals such as “buy x amount and get x amount for free”, plus apparently abroad, they also get to use Bath & Body Works coupons such as “$20 off whatever“, etc…). Like I’ve said before, it’s doable if you only buy a handful of stuff every once in a blue moon, but when you regularly purchase stuff from them in bulk (like I do), it kinda’ adds up. 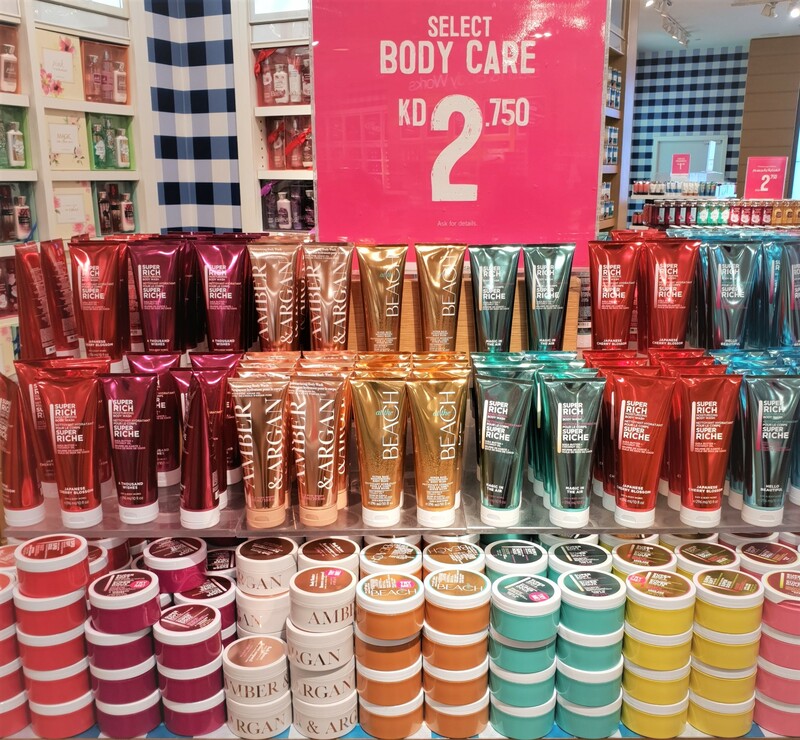 Especially, when you factor in that you can actually buy 15 shower gels (if not more) from the Sultan Center or wherever, for the price of 4 shower gels from Bath & Body Works. 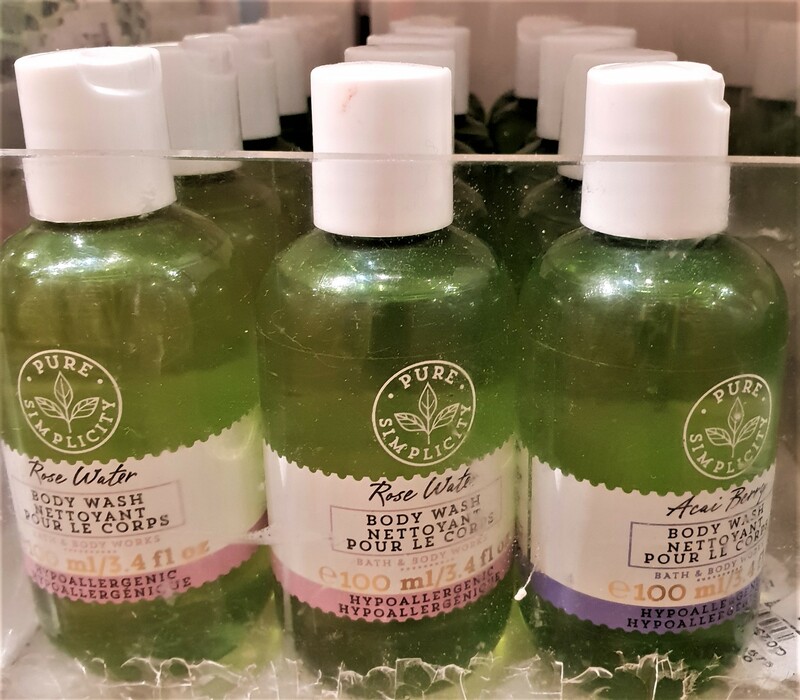 To be honest, the quality of drugstore shower gels has steadily increased over the years and now, they’re on par with shower gels from Bath & Body Works even (from the ingredients list to the delightful scents)! That’s another reason why I swore off Bath & Body Works (I could find the same stuff elsewhere, for less cash). 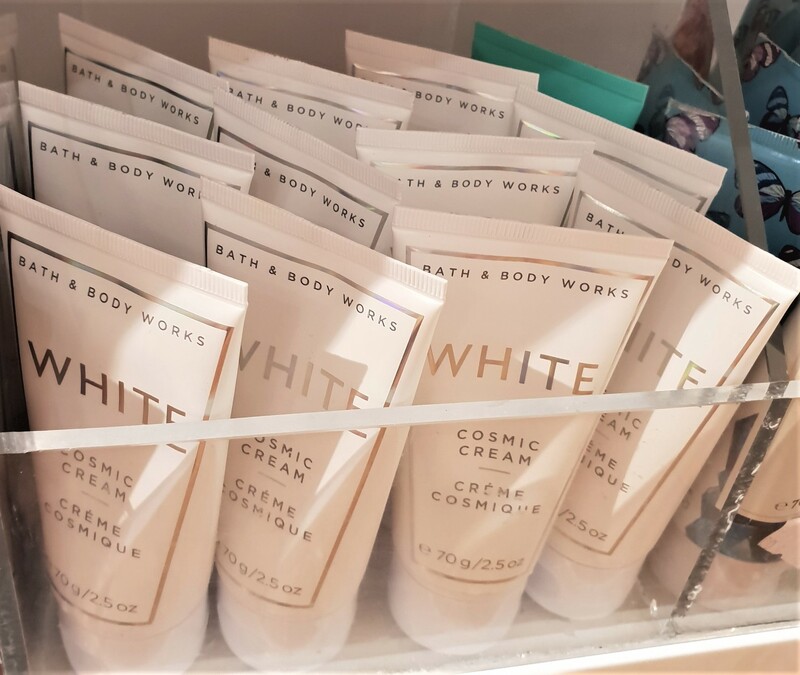 Also, a lot of the newer collections just don’t seem to excite me anymore… up until my latest haulage (here) which rekindled my interest in Bath & Body Works! 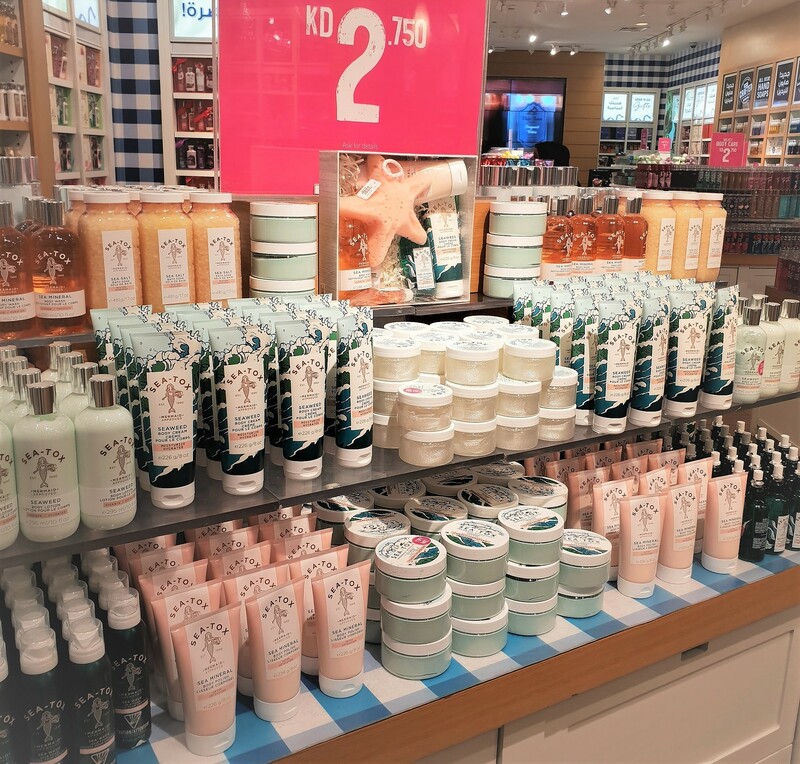 Both the Water Collection (featuring Hyaluronic Acid) and the Mermaid Approved Sea-Tox Collection (featuring Seaweed) greatly appealed to me! 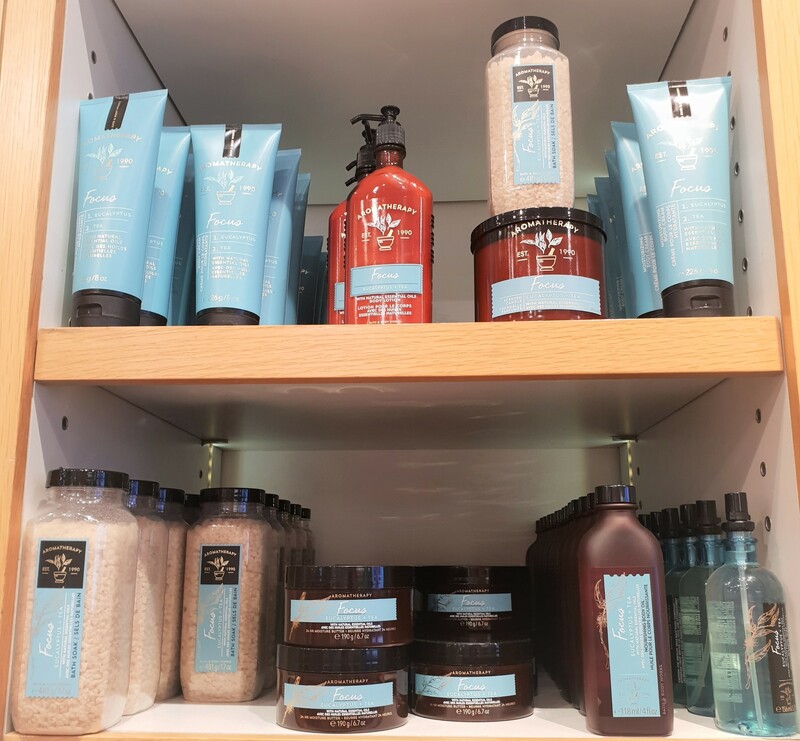 The scents were gorgeous (especially the unisex scent of the Sea-Tox Collection)! The packaging was awesome! The products were pretty cool and performed great! If that wasn’t enough, everything had been knocked down to KD 2/750 ($9)! It was a short-lived promo, but such an amazing one, to the extent that I kinda’ went ham (here)! 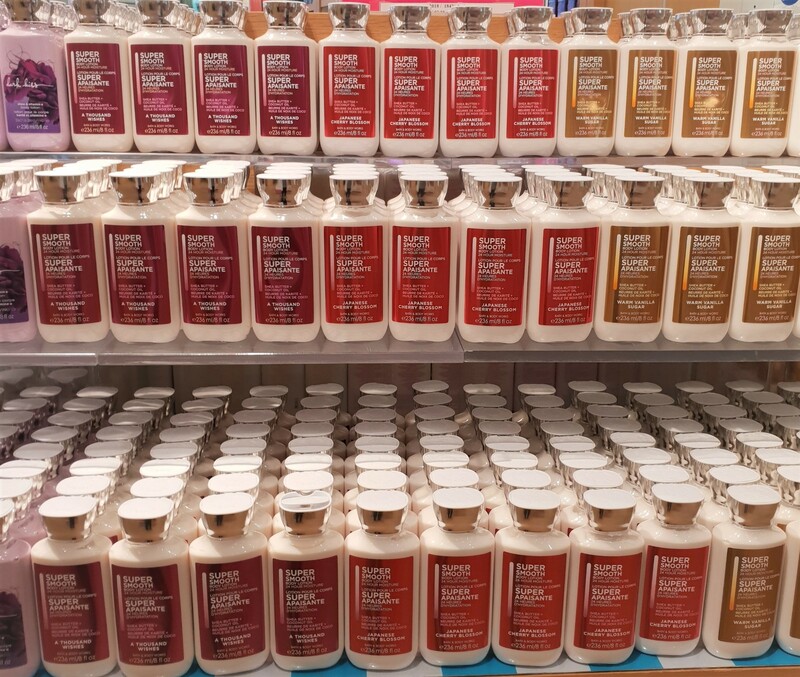 I wasn’t expecting lightning to strike twice, but I like visiting Bath & Body Works (even if it’s only window-shopping!) and was quite surprised to find almost everything knocked down to a less insane asking price! 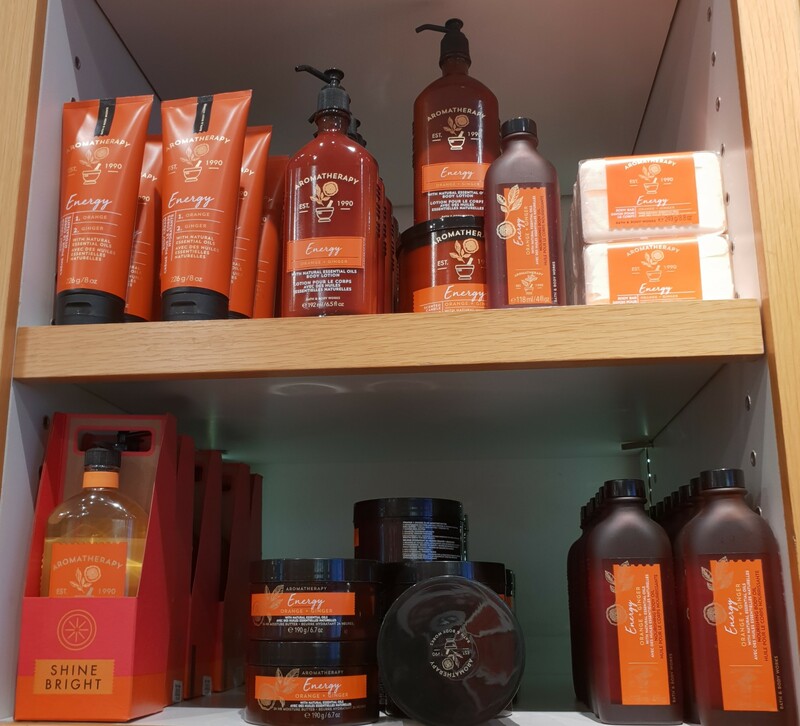 Also, the KD 2/750 promo now extended to all skincare and body care items! 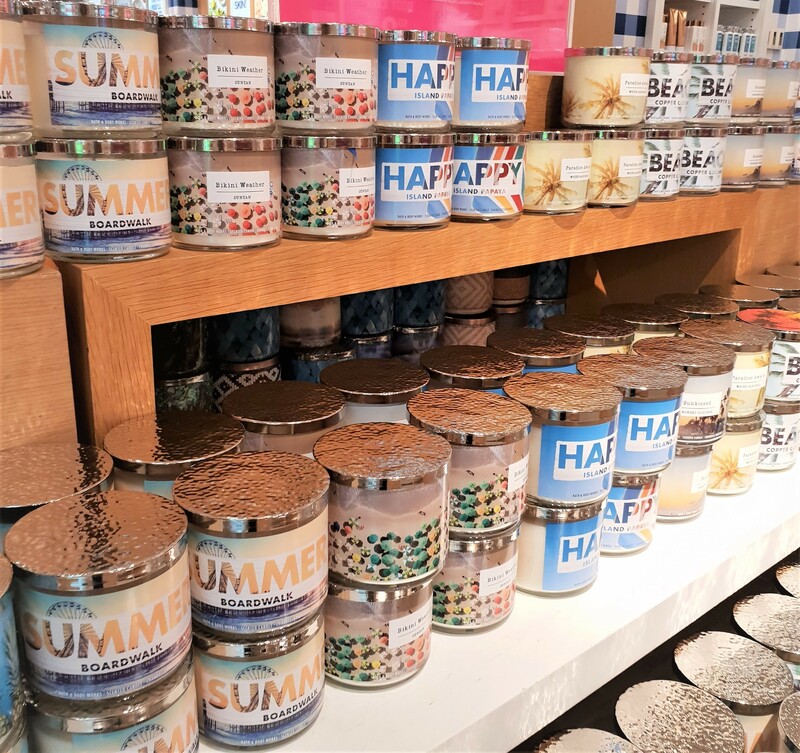 As you can tell from all their names and Instagram Filter packaging, these were all wonderfully Summer-y Candles! 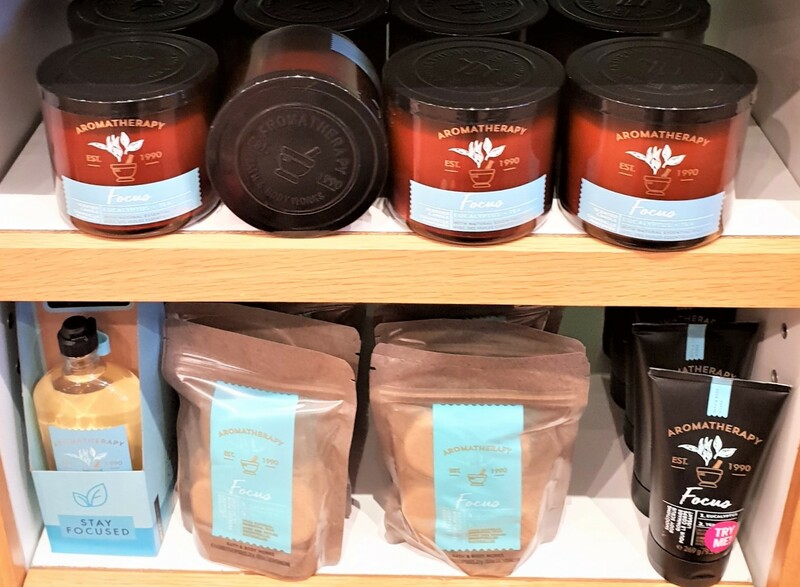 From the quintessentially beach-y vanilla and coconut scent of Tiki Beach to the oceanic and masculine Ocean Lover, to the hot weather candle counterpart of the Sweater Weather Candle called Bikini Weather Candle and everything in between, there was something for everyone (even those who enjoy florals, blech)! I mean how pretty is the packaging on Ocean Lover? 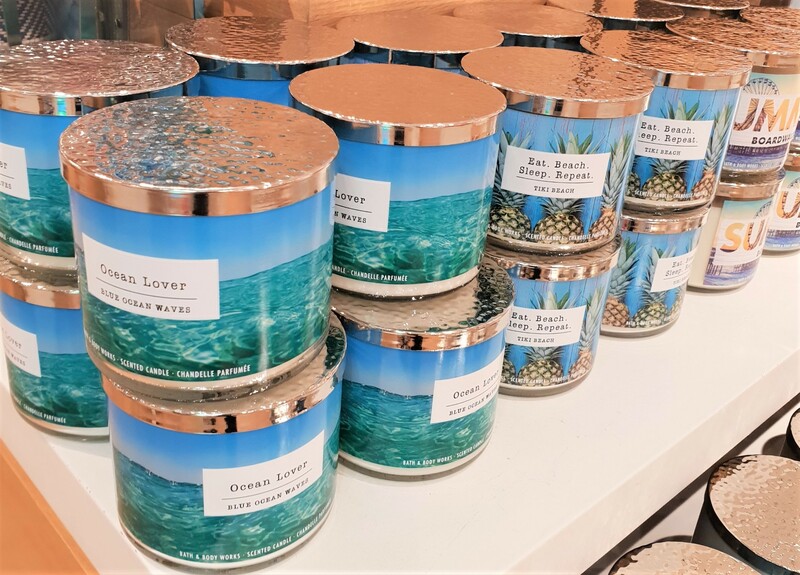 As for Eat, Beach, Sleep, Repeat (lol) which has the scent Tiki Beach, I’ve actually purchased the original Tiki Beach Candle (here) and repurchased its reincarnation x3 Bora Bora Tiki Beach Frosted Candle (here) and even have one unlit on my desk at work! So I can honestly say it’s an absolutely gorgeous scent! Honestly, the packaging on the majority of them was very appealing! Unfortunately, the scents were less so. 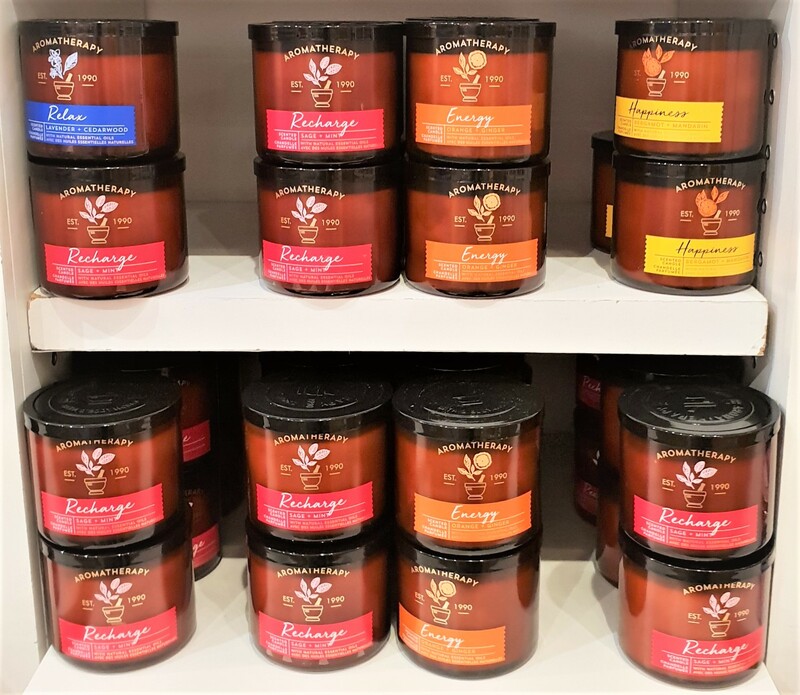 Aren’t the candles on the top row just… beautiful? That said, I buy my candles more for their scent, rather than just their packaging. 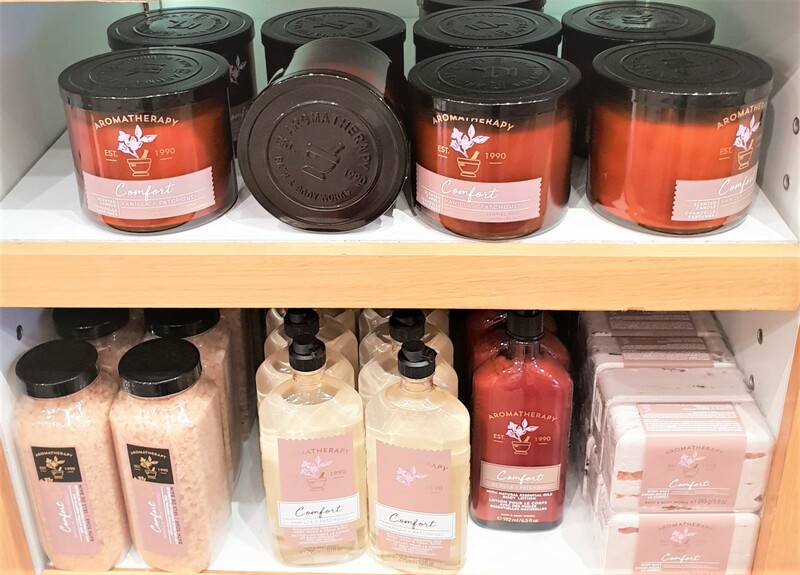 As pretty as these were, their scents just didn’t appeal to me (I found them a bit… boring). I’ve purchased Mahogany Teakwood more times than I can count (first haulage here and last haulage here) and haven’t always blogged about repurchasing it because I just buy it and gift it to people way too often, but as delightful as I find that gorgeous masculine scent (it straight up smells like “hot guy”), I’m kinda’ bored of it… at the moment. I’m not one for florals (because… eww), but dang was I tempted! The packaging of Eucalyptus Rain (black with multicolored print) just spoke to me! Heck, even Casablanca Lily looked pretty… pretty (like a watercolor painting or something)! However, as I said earlier, if the scent doesn’t appeal to me, I’m definitely not getting the candle, no matter how pretty it looked. 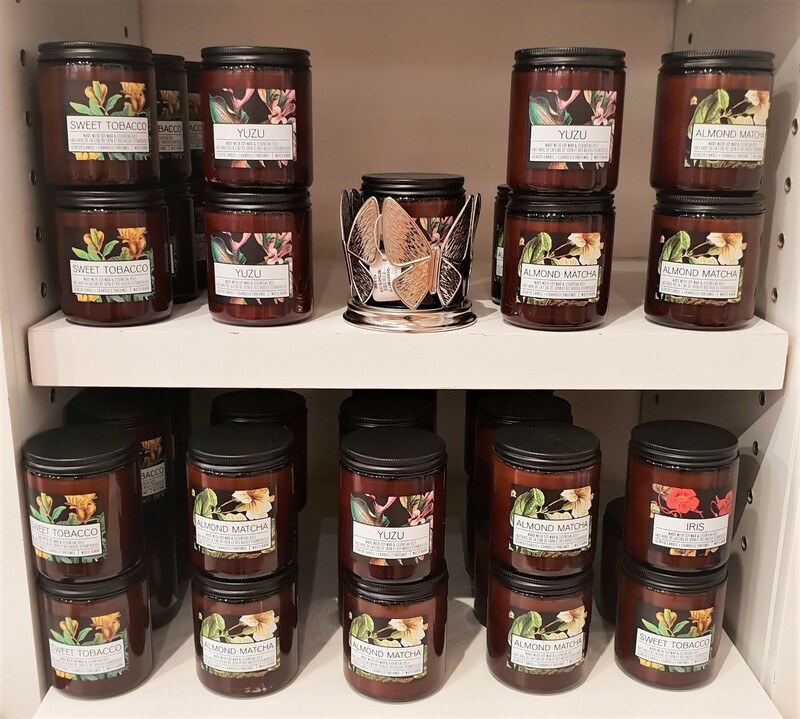 The ones I was most curious about from this collection was the Pistachio Ice Cream Candle and Honeysuckle & Freesia Candle, but sadly they were nowhere to be found. Anyways, all of these were from the Spring 2018 Collection. 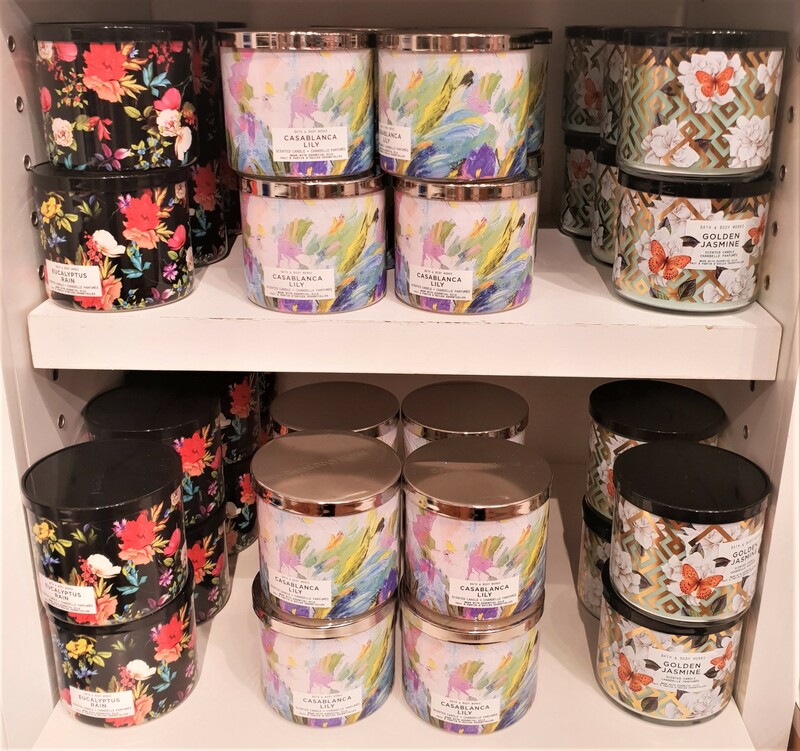 Talk about beautiful, these Prism Candles were something I’d never seen before at Bath & Body Works! 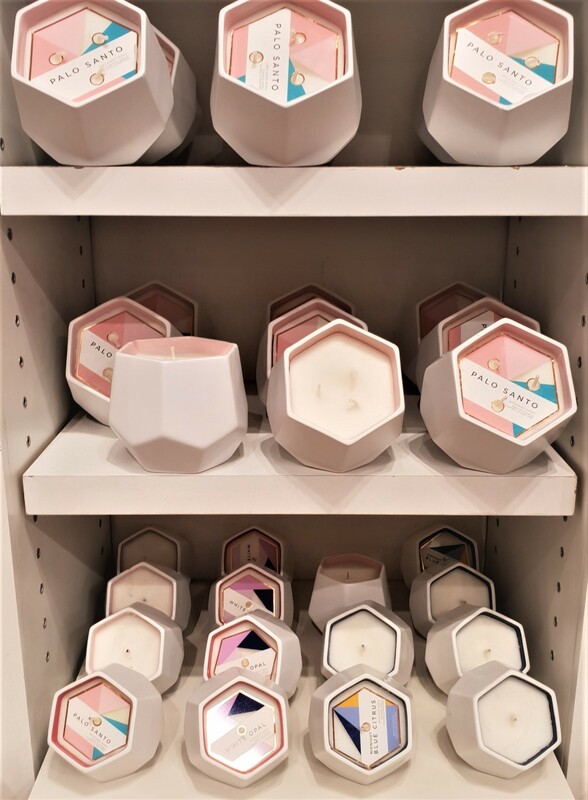 I mean sure, everyone has a hanging rose-gold hexagonal something or other (be it a candle-holder or terrarium or whatever else), at this point, but for Bath & Body Works to come out with hexagonal candles is pretty cool! 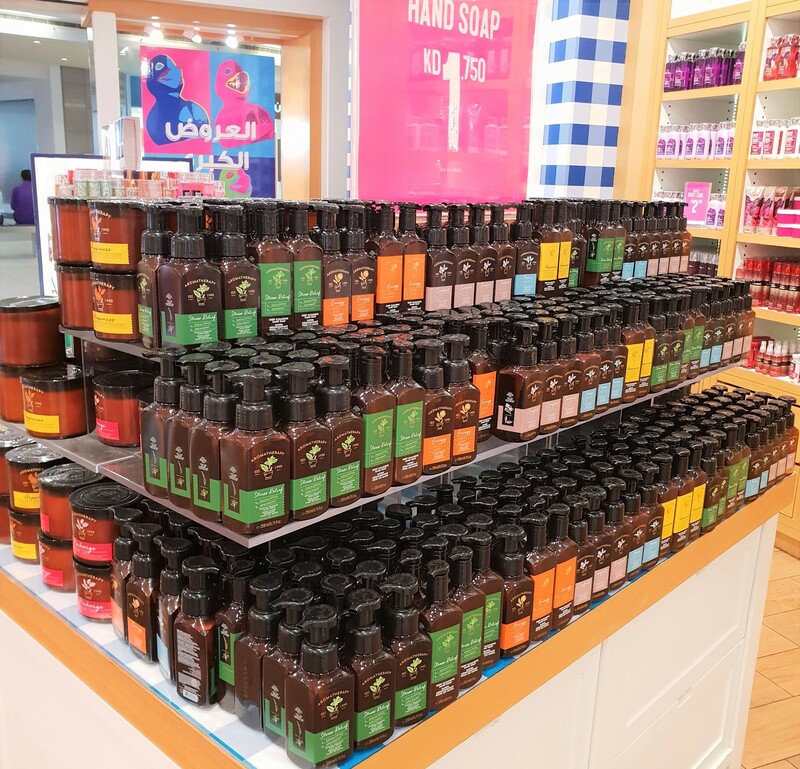 This is exactly what I meant when I mentioned (at the start of this post) that Bath & Body Works are continuously keeping up with the latest trends. 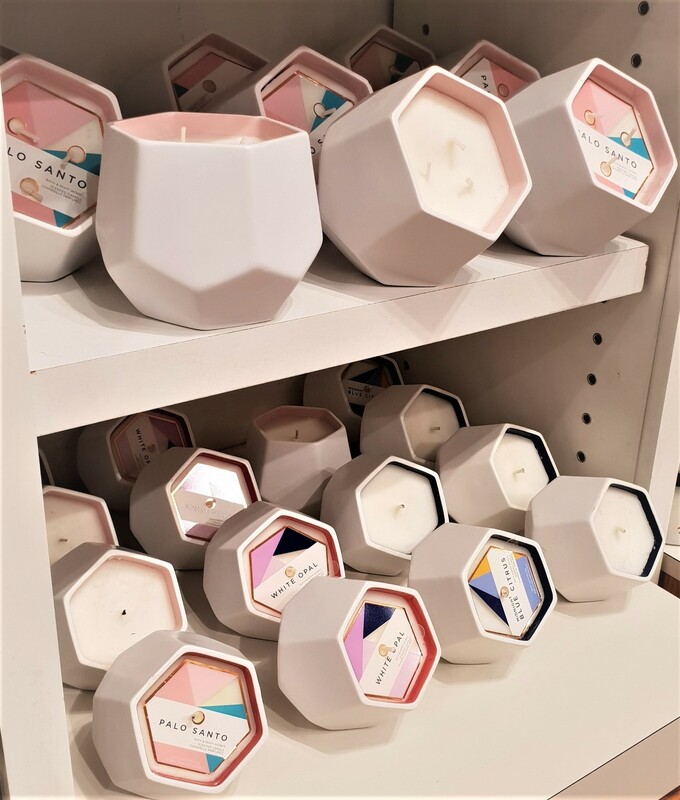 Heck, even the actual scents of these Prism Candles were quite trendy! For some reason, all things “spiritual” (from Crystals such as Rose Quartz to Plants and Herbs such as Sage and Cedar) that are used for both physical and mental well-being (sorta’ like a smudge stick, I’m guessing) are currently having a “moment” and now, that extends to Palo Santo (which literally translates to “Holy Wood” from Spanish). 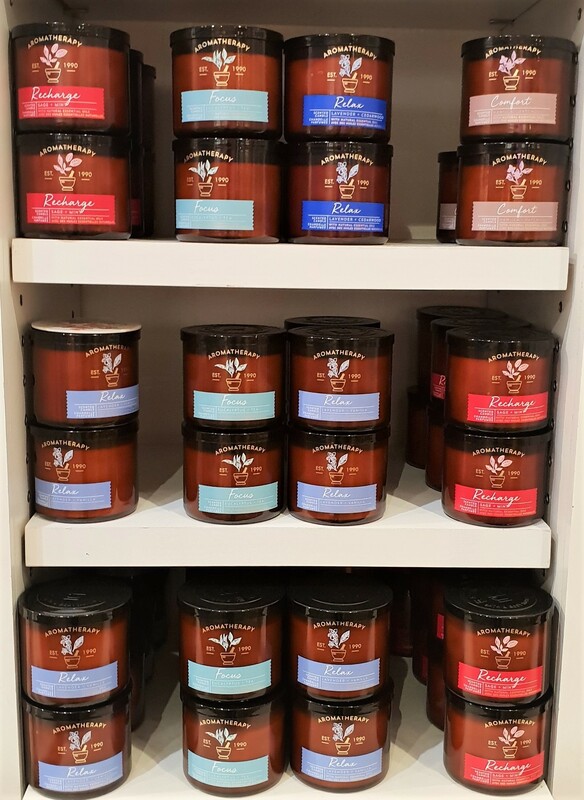 Love ’em or hate ’em, there’s no denying these things look pretty unique, especially in comparison to the rest of the Bath & Body Works Candles! With that being said, I’m totally going to skip Palo Santo because for all I know, it actually attracts “evil spirits” as opposed to warding them off (again, keep in mind that I’m 33 years old lol). 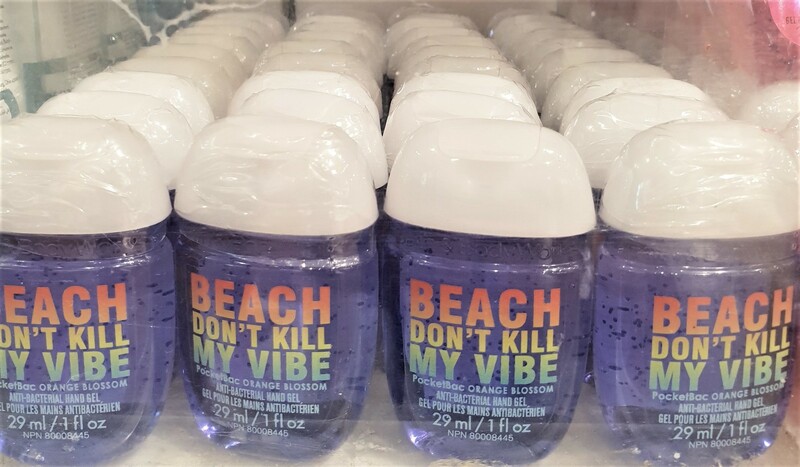 I doubt the people over at Bath & Body Works actually looked into (not deeply, anyway). So as unlikely as it is that the candle would attract negative energy instead of warding off negative energy, I’m still going to skip it (‘cuz I’m scurred), but I might get White Opal or Midnight Blue Citrus in the future. However, even if you don’t plan on ever lighting them (which is… up to you, obviously), they’d still add a nice touch to your living room (on a stand-alone shelf or end-table somewhere). To be fair, my nose was burnt out at this point. 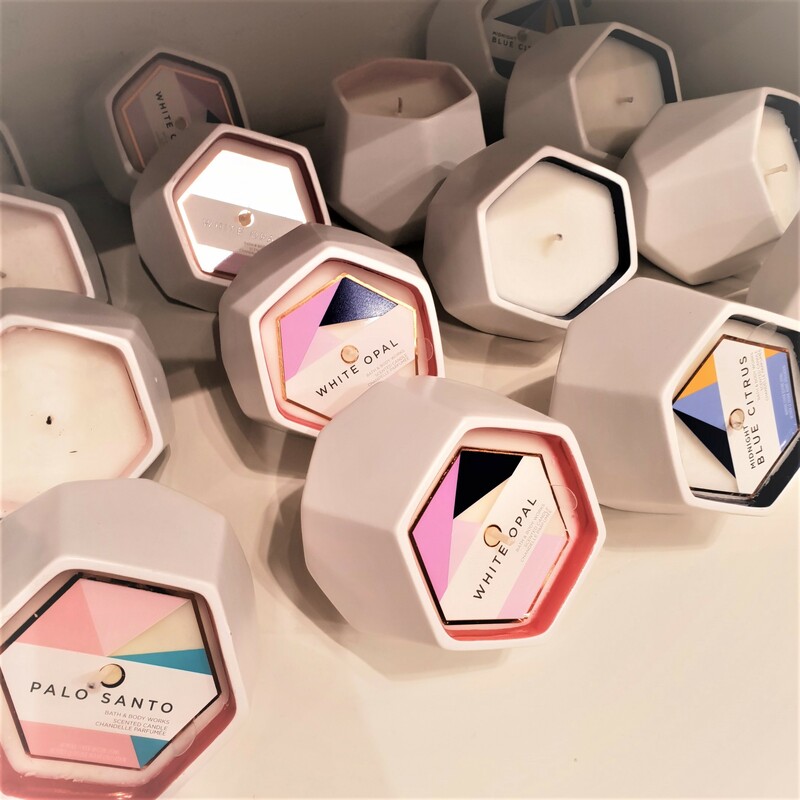 Scared or not, had I been able to smell Palo Santo and had I found the scent pleasant, I totally would’ve sprung for it (well… maybe not, because… “evil spirits”)! 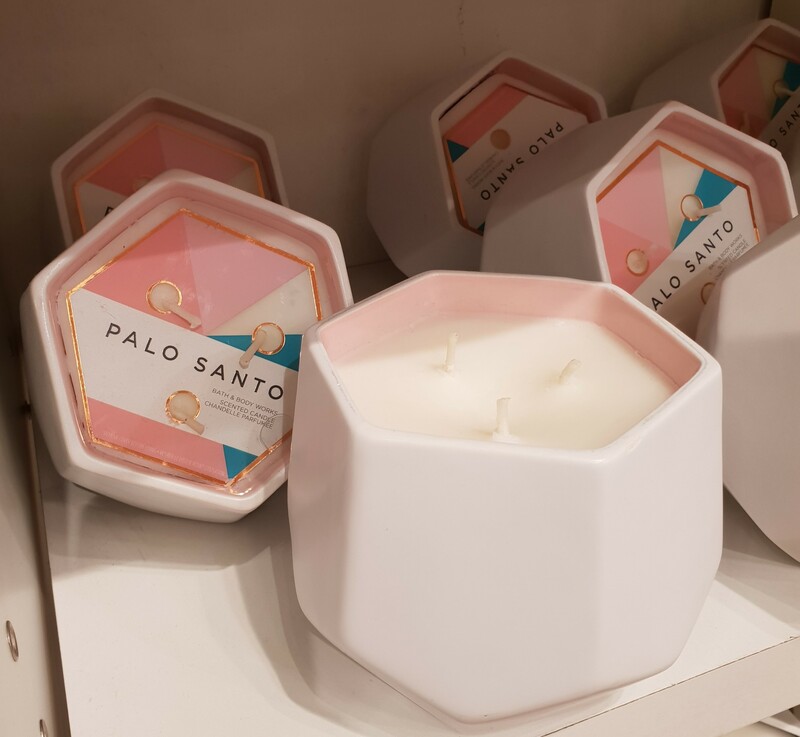 Also, these 3-wick Palo Santo Prism Candles were huge (meaning, commitment) whereas the smaller 1-wick Prism Candles in the other scents were less of a commitment. I didn’t wanna’ buy this beast of a candle only to go home and realize that I actually dislike or worse, can’t stand the scent. Ya’ feel me? Yeah you do. 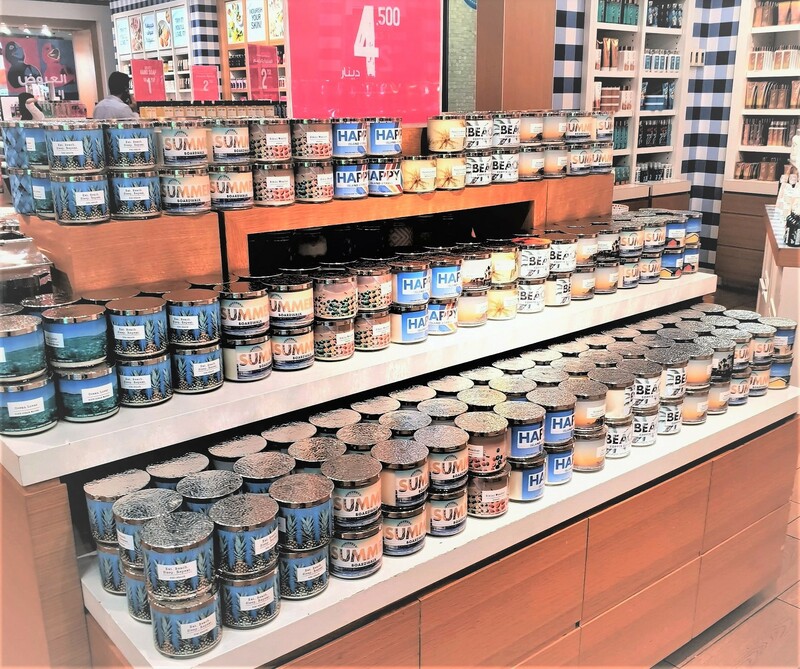 These were the largest Bath & Body Works Candles, ever! I believe they were also new (Spring 2018) and I’m pretty sure I’ve seen them earlier in the year. The black lids looked pretty cool! 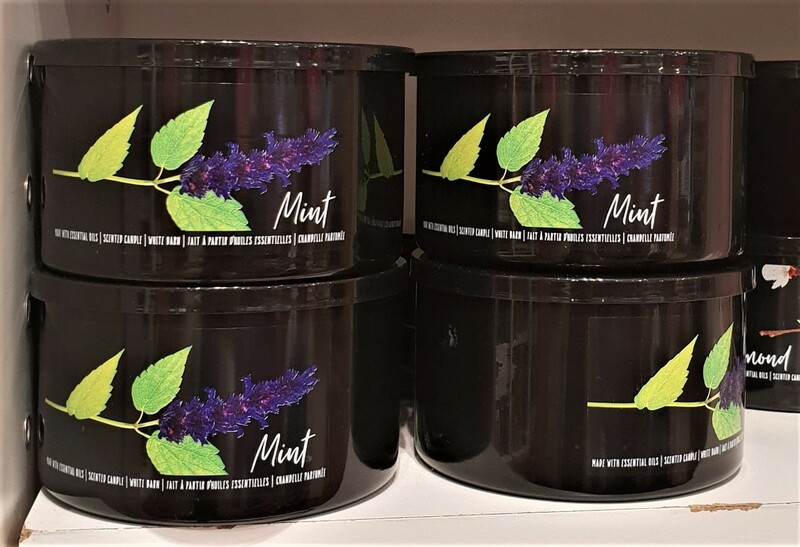 Heck, the entire packaging of the Mint Candle was aesthetically appealing to me! However, I’m not big on veggies and herb scents. 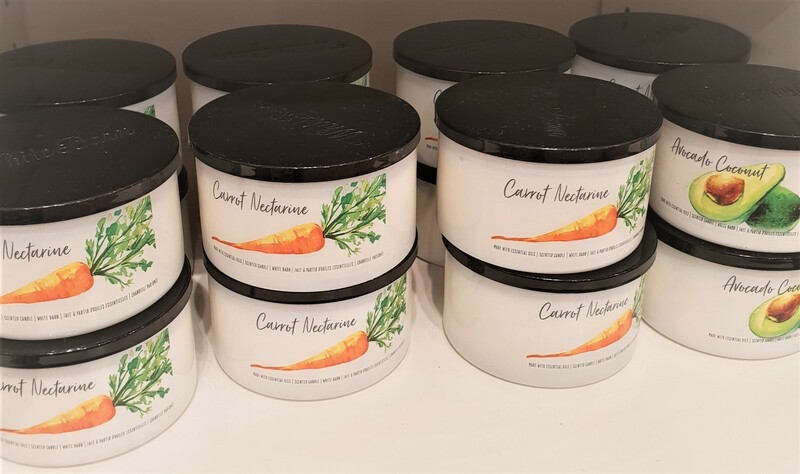 I was flirting with the idea of getting the Carrot Nectarine Candle (it’s not my usual scent, but it was something different) for half a sec, but I didn’t wanna’ commit to a huge candle with a scent I wasn’t 100% obsessed with. Also, my nose was burnt out. All I could think of was that show Bondi Rescue on one of the Showtime/OSN Channels. I never actually watched it (I’d always switch the channel before it would come on), but I gave the candle a sniff just for the sake of the show and couldn’t decide whether it was nice or not (burnt nose). 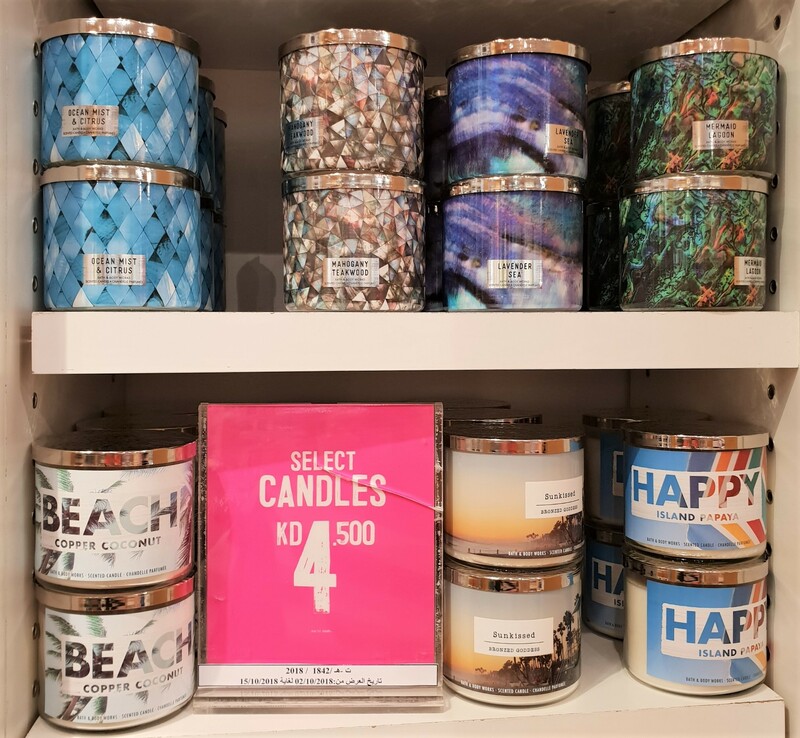 I’m pretty sure I’ve seen these before at Souq Sharq early on in the year as well (along with the Veggie Candles with Black Lids). 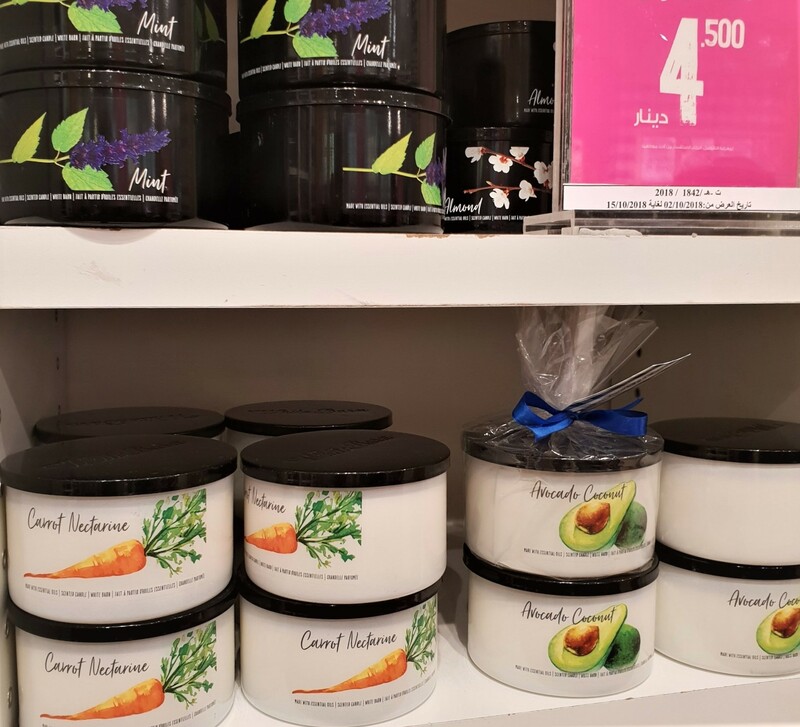 I really wanted to love them, because they looked and sounded delightful (from Sweet Tobacco to Yuzu and even Almond Matcha), but the actual scents just weren’t for me. 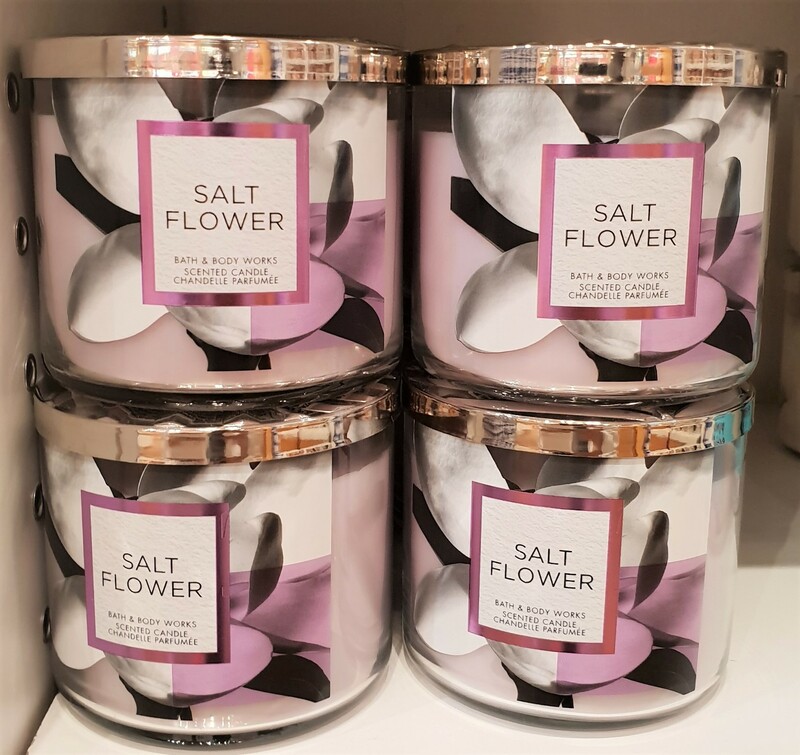 I’ve never seen Salt Flower Candle before and was absolutely smitten! I mean, I’m pretty sure there’s no such thing as Salt Flower, but doesn’t it just sound cool? Also, the packaging was pretty! I figured I’d come back and give it a sniff at a later date (when my nose wasn’t burnt out). I didn’t bother sniffing any of these because I knew I couldn’t smell anything properly anymore. Based on the notes, I’m thinking Comfort would be great during Winter! Focus would be great for students, writers, coders, etc…! Relax would be great for the bedroom (not for me, because eww Lavender) or perched on a bathtub during a Bubble Bath! Recharge might be good for when you’re working out or more likely in the kitchen? I dunno’ about that one. 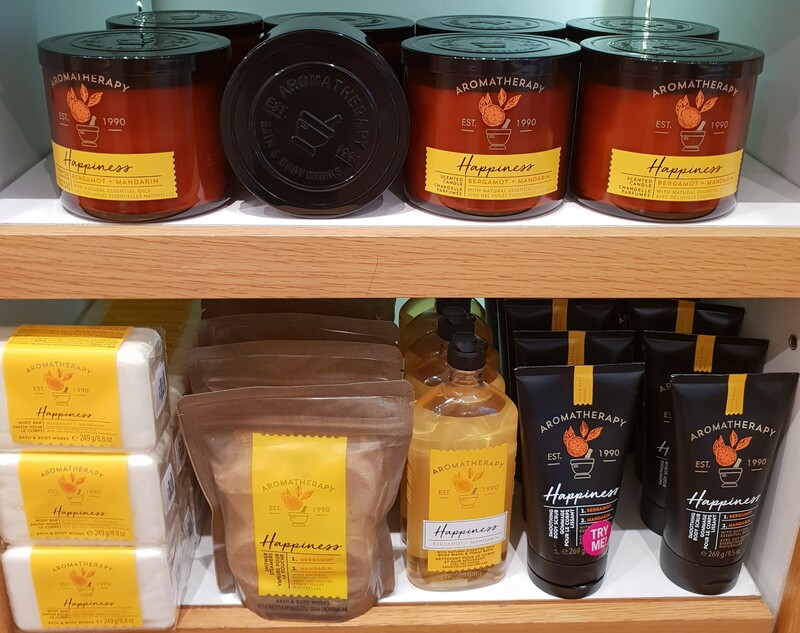 Oooh Happiness sounds right up my alley (I adore Bergamot)! 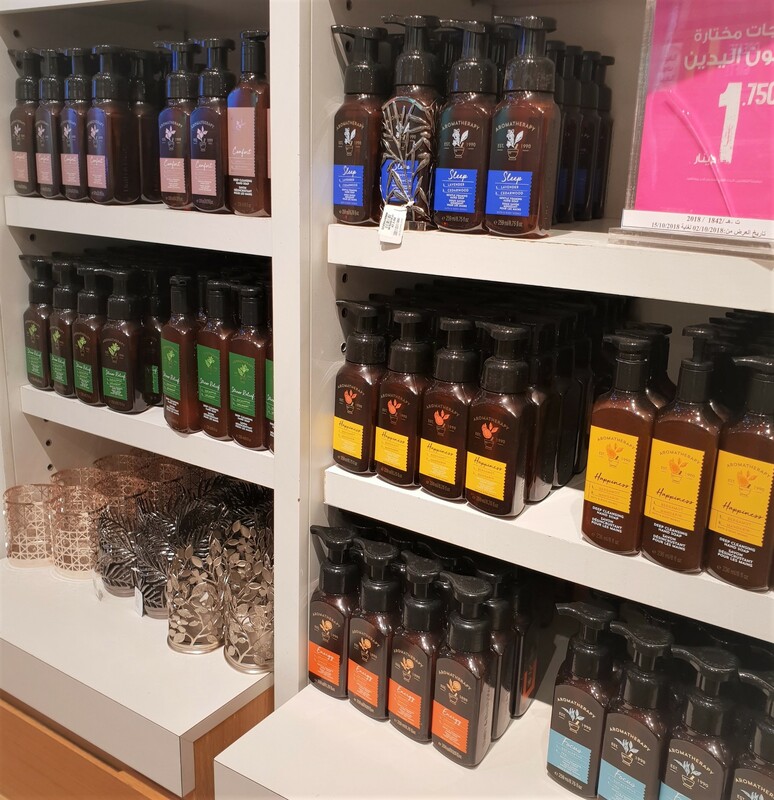 I’m pretty sure I’ve purchased a few mini shower gels and mini body lotions of the older Aromatherapy Collection (maybe even as far back as 2010). Yeah, it was called Sensual (Black Currant Vanilla) and came in red packaging and smelled ah-mahzing! I just never got a chance to take a picture of it or even blog about it. I purchased those minis in bulk (x4 at a time). The other one was just… one lol called Energy (Lemon Zest) which I did manage to blog about after I finished it up (here). I was sad when those two (mostly Sensual) got phased out. At least they now offer several alternatives in a variety of interesting new products (da’ heck is a Shower Steamer? lol Ok, I just googled it and now I’m convinced I need Shower Steamers in my life)! 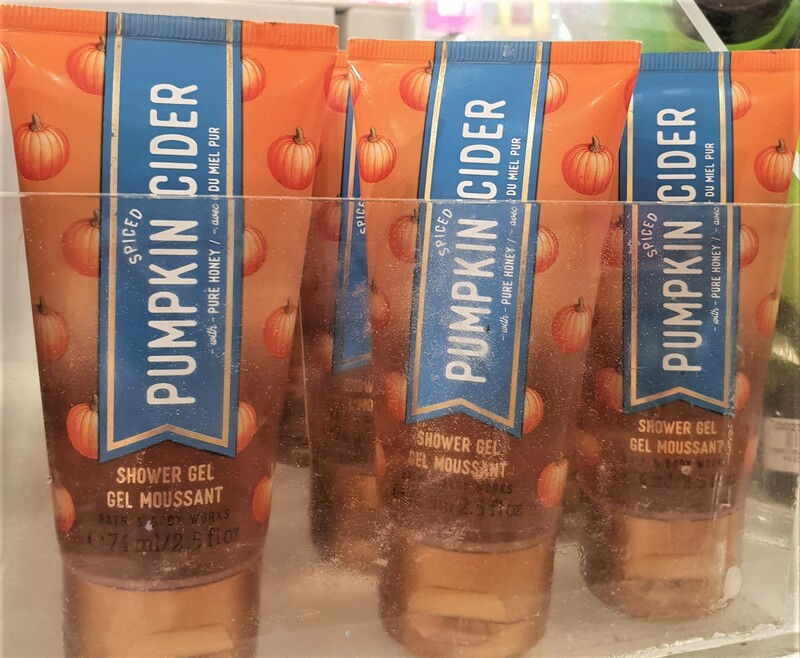 If I didn’t already have like… a hundred body lotions already, I probably would’ve picked up one of these, for the novelty of it. 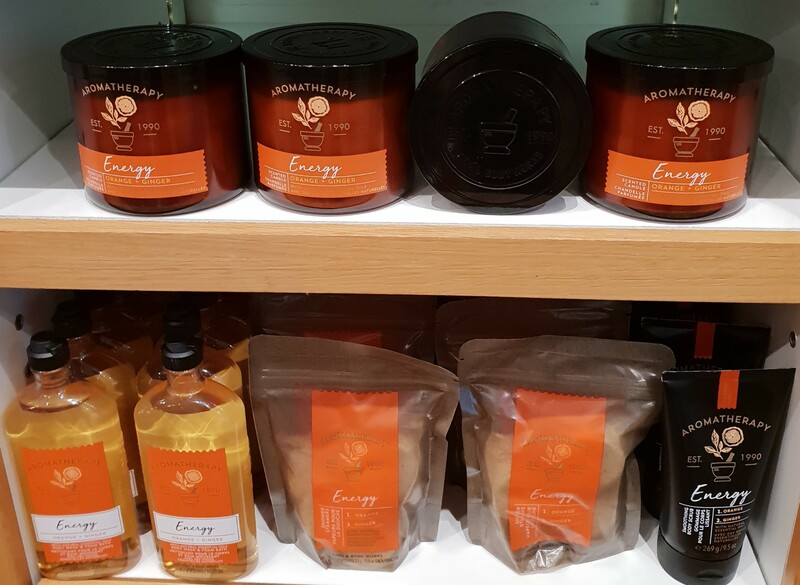 I mean, they’ve got Shea Butter (that the Bath & Body Works lotions usually have) plus Coconut Oil ergo Super Smooth! Who wouldn’t enjoy having super smooth skin, amirite? 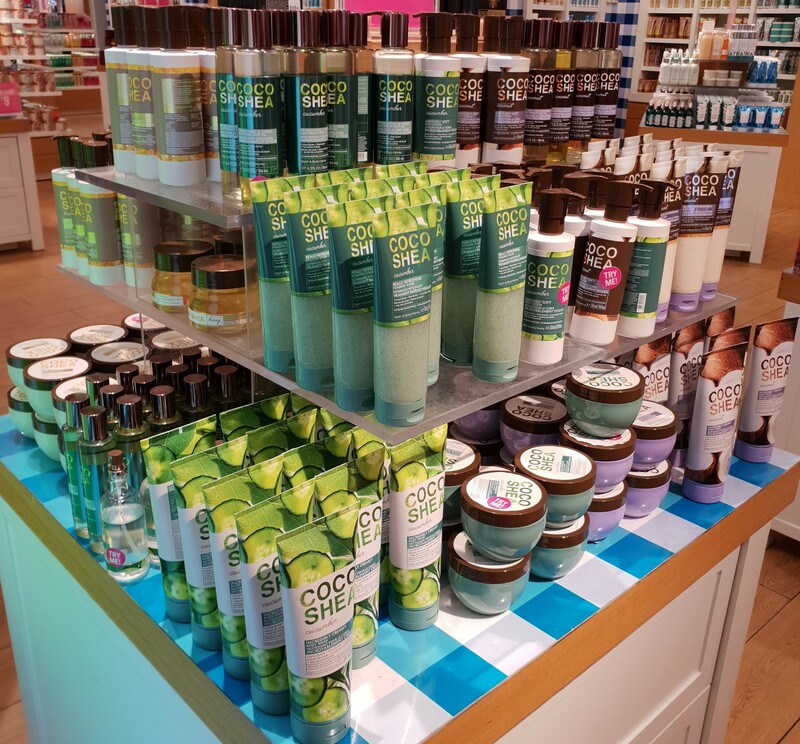 That said, I’m currently working my way through the CocoaShea Cucumber Seriously Soft Body Lotion (haulage here), not to mention all the other Bath & Body Works Moisturizers I just purchased recently and all The Body Shop Moisturizers I picked up prior, so that’s why I had to skip these. Otherwise, I totally would’ve picked one up. 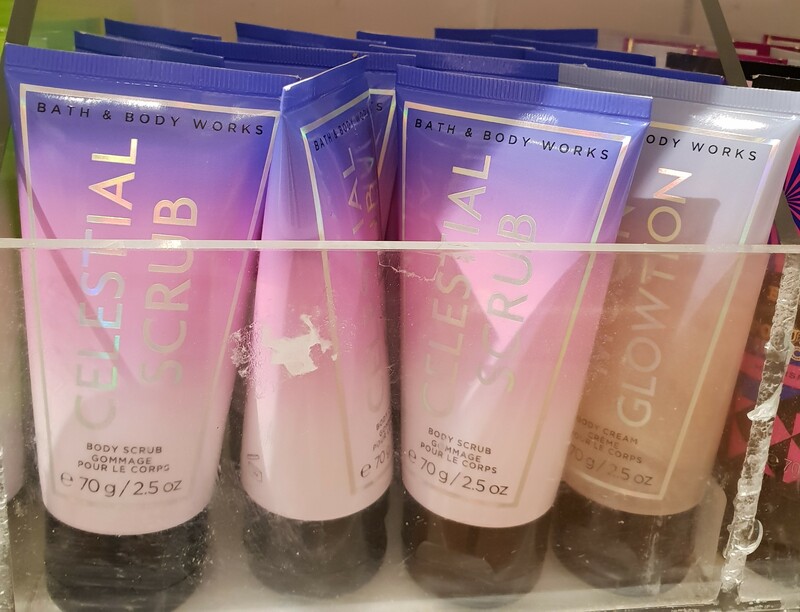 Heck, I even like the no-frills packaging (makes it seem like they mean business, “we gonna’ moisturize the heck out of you, no time for frills” sorta’ thing). 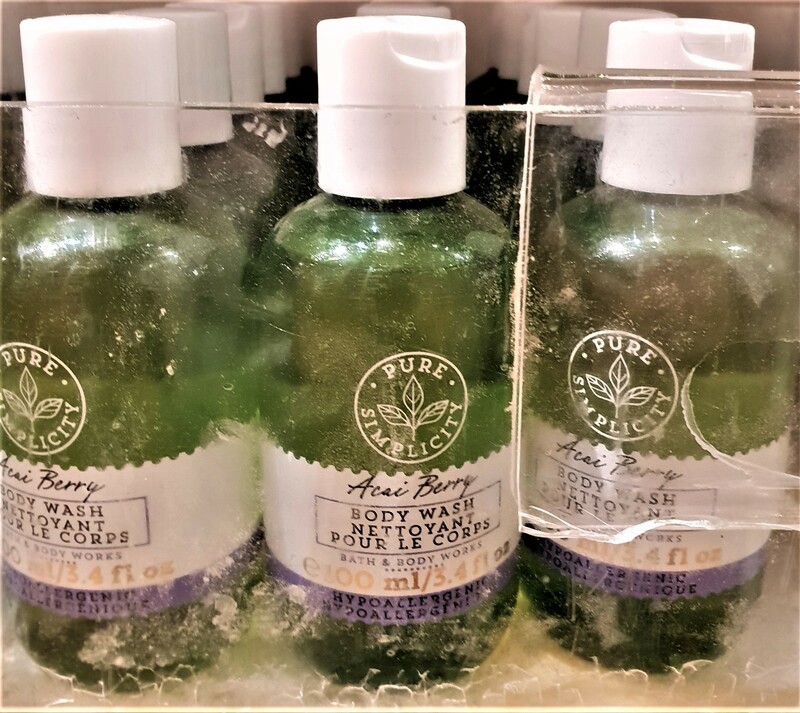 Yeah so the packaging of the Body Wash is horrible. 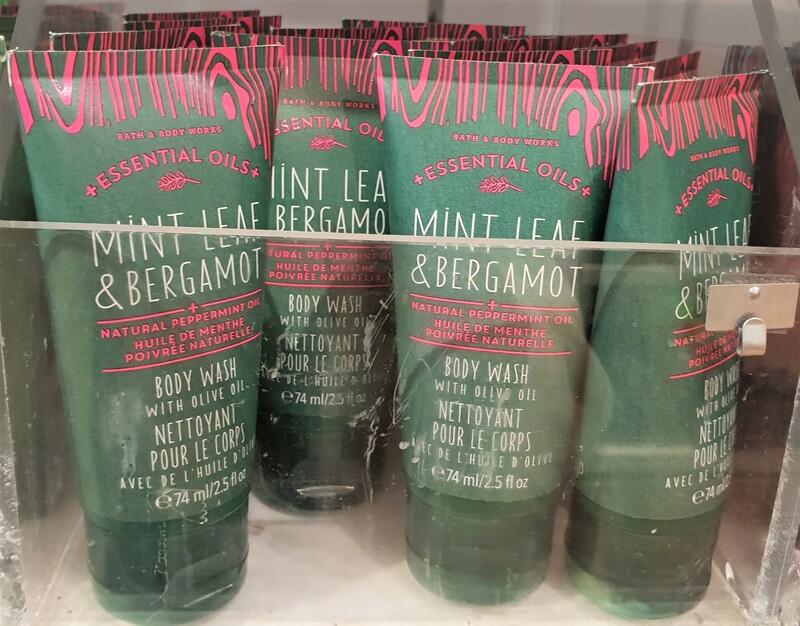 I’ve mentioned it before, but any products from any brand, in this particular packaging, goes bad in a month or two (sometimes maybe three or more). 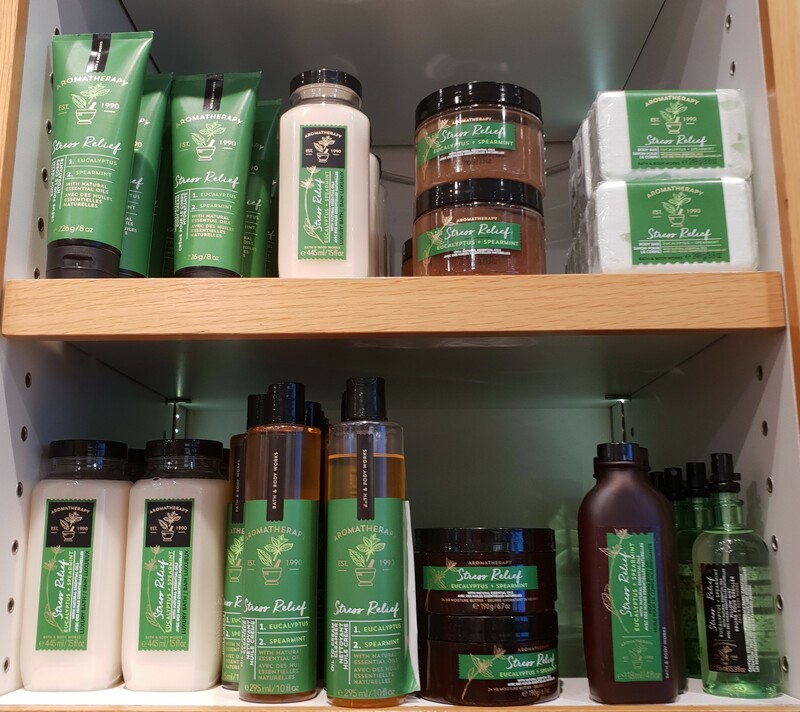 The scent of the product changes into something very different from what you originally purchased. Sometimes, even the color of the actual product changes. I’m thinkin’ it has something to do with the extreme heat in Kuwait. I could be wrong though. Whatever the reason, the packaging is terrible! Don’t waste your money. 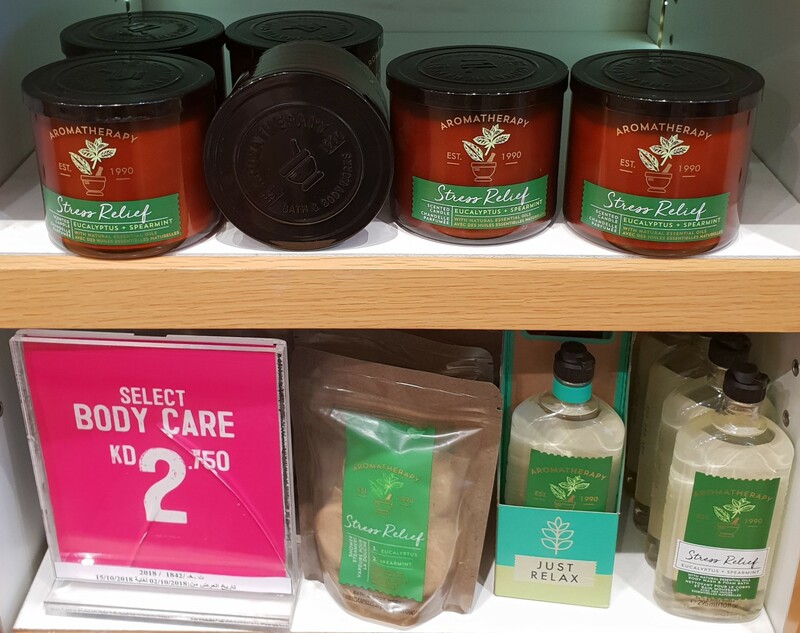 As for the Body Butter, I haven’t tried these before, because I’ve had my fill of Body Butters from The Body Shop. They’re so thick and waxy and usually start to pill (roll up into tiny little balls) on me. So rather than get stuck with a dud, I decided to skip these too. However, some people love ’em! So… purchase at your own discretion. 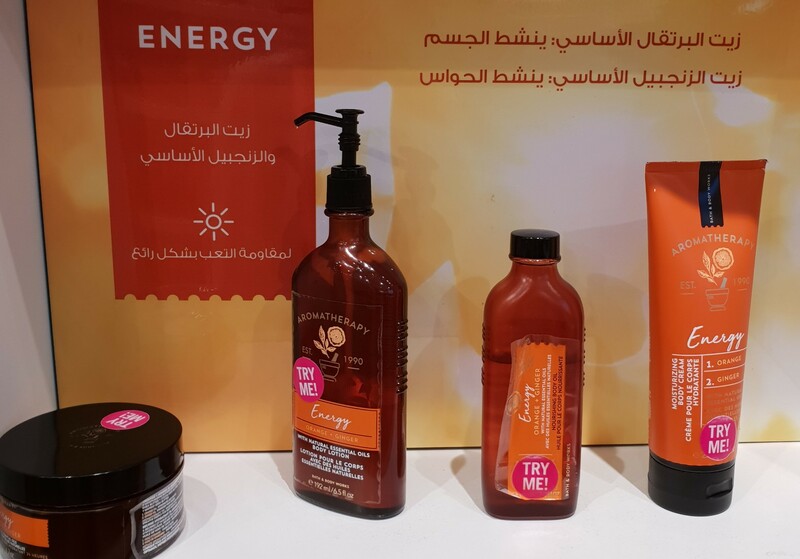 I’ve definitely seen the Amber & Argan ones when they were first released and even though I’m not one for “moisturizing body wash” (pet peeve: residue) was kinda’ interested in getting one, up until the pushy Sales Assistant chased me away (I wanna’ say at Souq Sharq possibly). 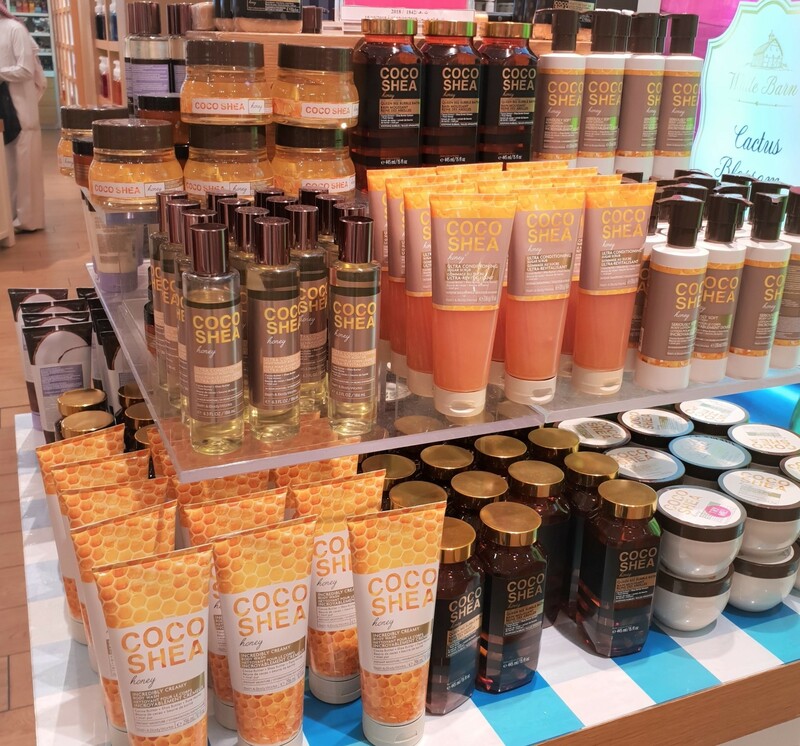 CocoaShea was one of my favorite Bath & Body Works Collections in the more recent years (haulage here)! 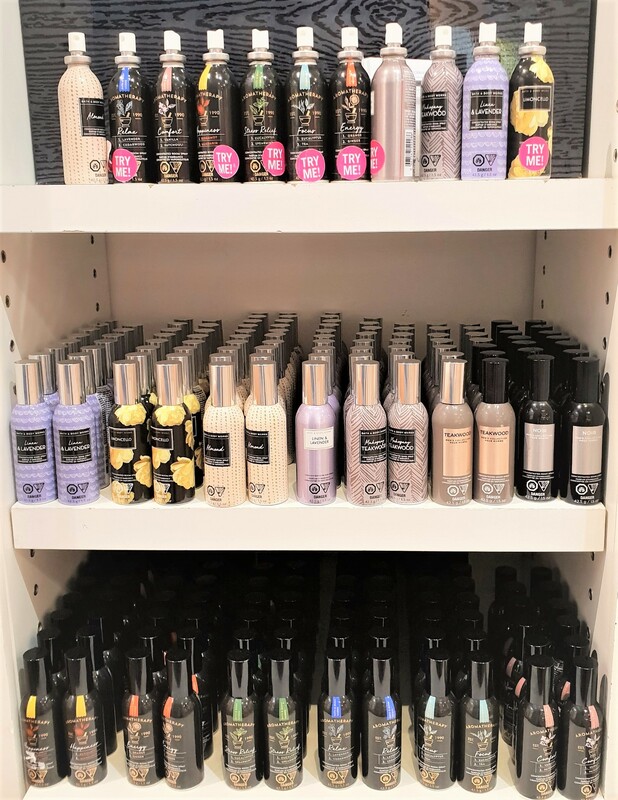 From the wonderful variation of texture to the gorgeous scents to the delightful products themselves, the entire collection was so fun! 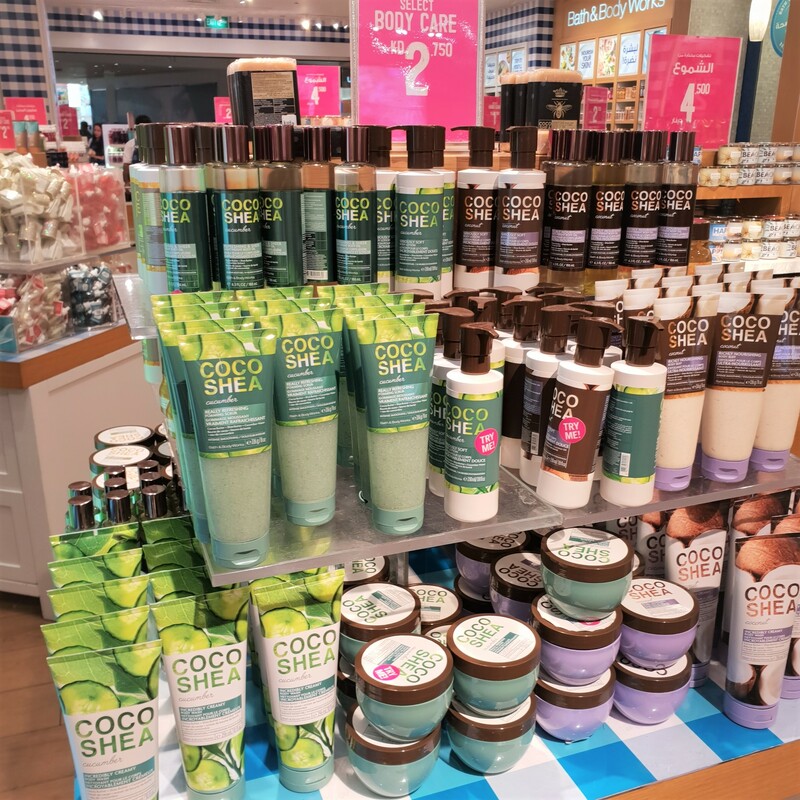 CocoaShea Cucumber Really Refreshing Foaming Scrub was one of my favorite scrubs (from the scent to the consistency to its performance to the packaging) that I had to grab another (mine was running low), especially now that it was knocked down to KD 2/750! 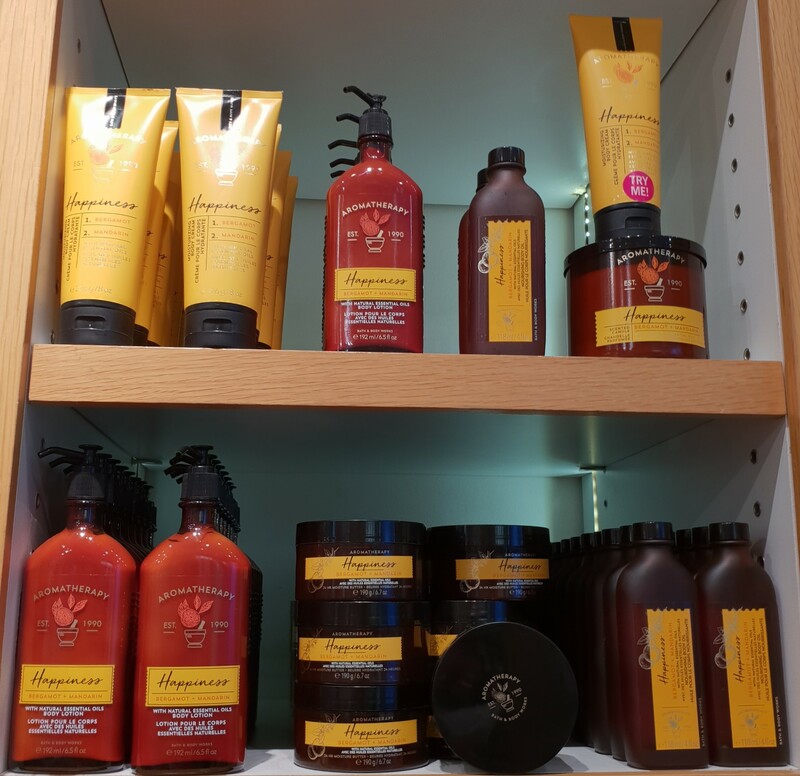 CocoaShea Honey Ultra Conditioning Bath & Shower Jelly (haulage here) was such a cool product! Other than being a hydrating body cleanser it doubled as a shaving jelly! Also, it had such a fun squishy consistency and smelled divine! 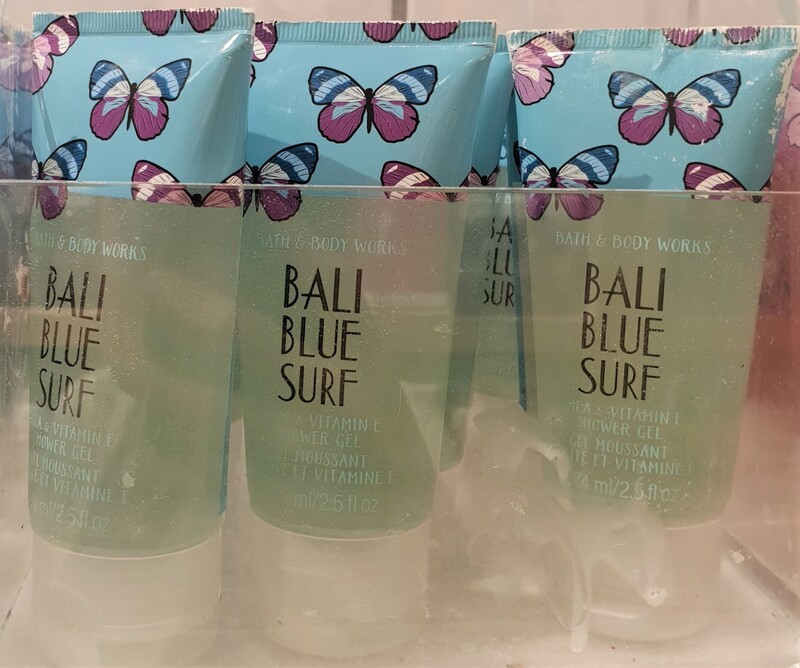 Et tu, Bath & Body Works? I blame Clinique for starting the whole fitness makeup and skincare trend. On the other hand, another new Dry Shampoo to try (yay!) and also the Charcoal products are all glycolic acid this and detox that (I’m all about that life!) so I’m pretty excited to play around with those (if I do eventually get around to purchasing any of them). 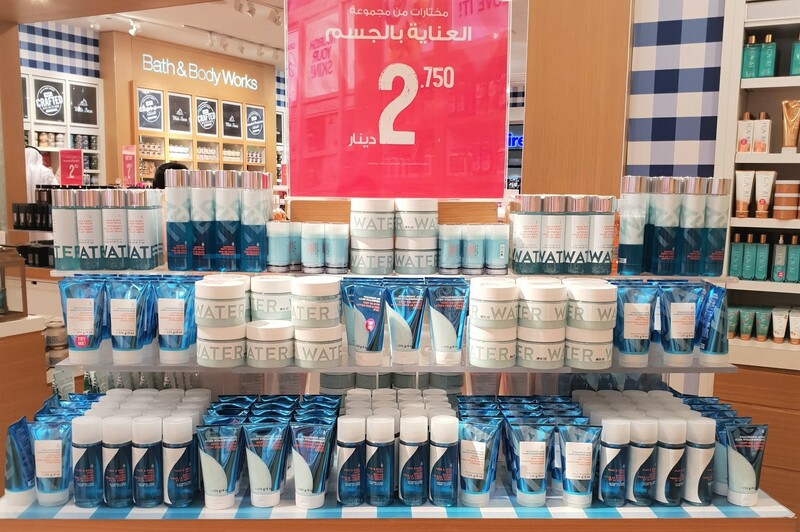 Apparently, we are missing the Fresh in a Flash Body Refreshing and Yoga Mat Mist and the “Fit Happens” Sports Water Bottle, in Kuwait. 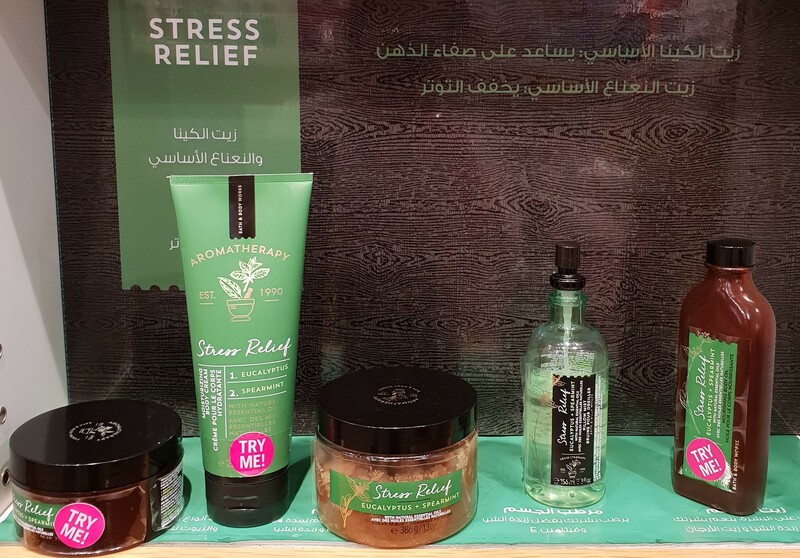 Kick Start Revitalizing Foot Scrub – Wake up your feet! This revitalizing foot scrub refines and nourishes to reveal softer, smoother feeling skin. 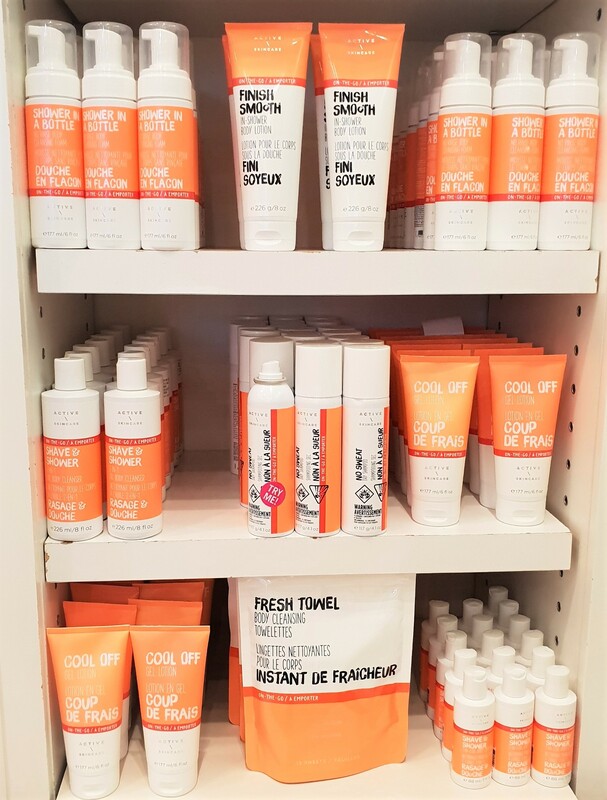 Our active skincare collection is made with the good stuff (glycolic acid & shea butter). 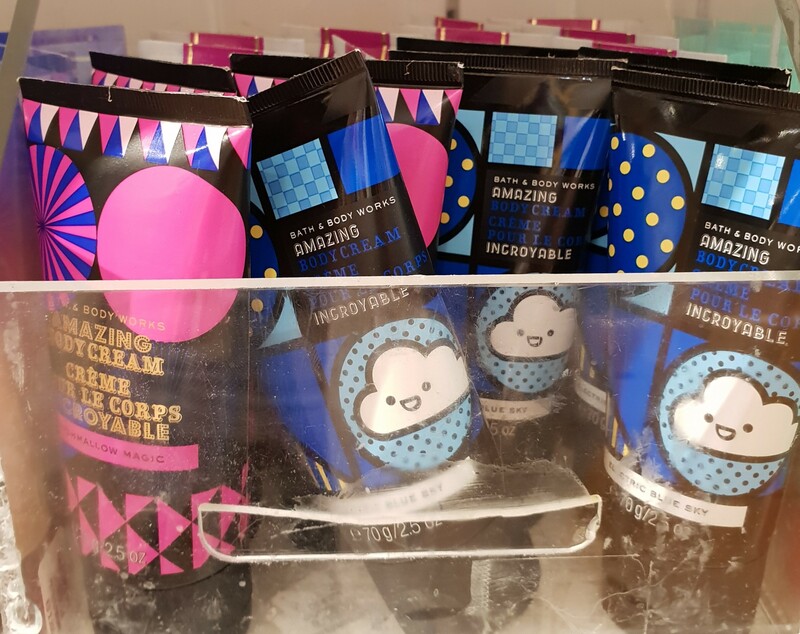 Hand Hero Ultra-Relief Hand Cream – Your skin savior is here! 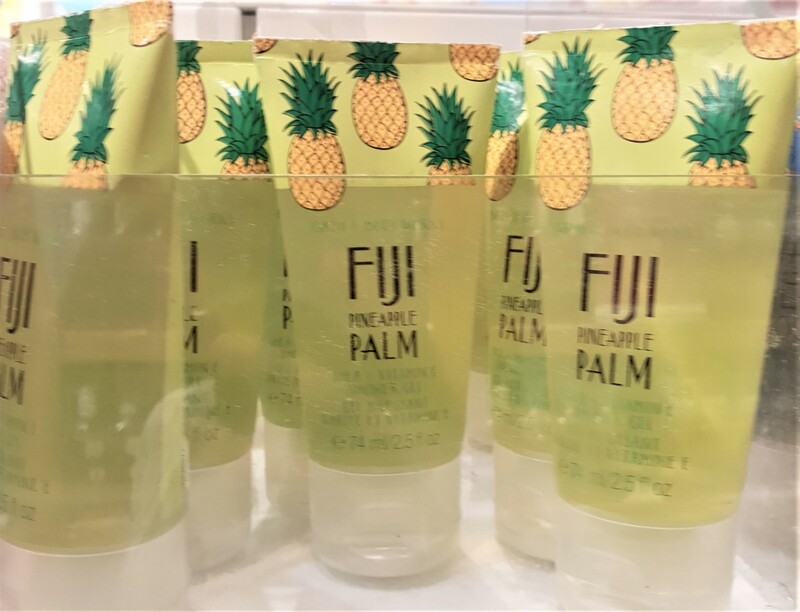 For a quick fix, envelop skin in moisture with this softening and hydrating hand cream. 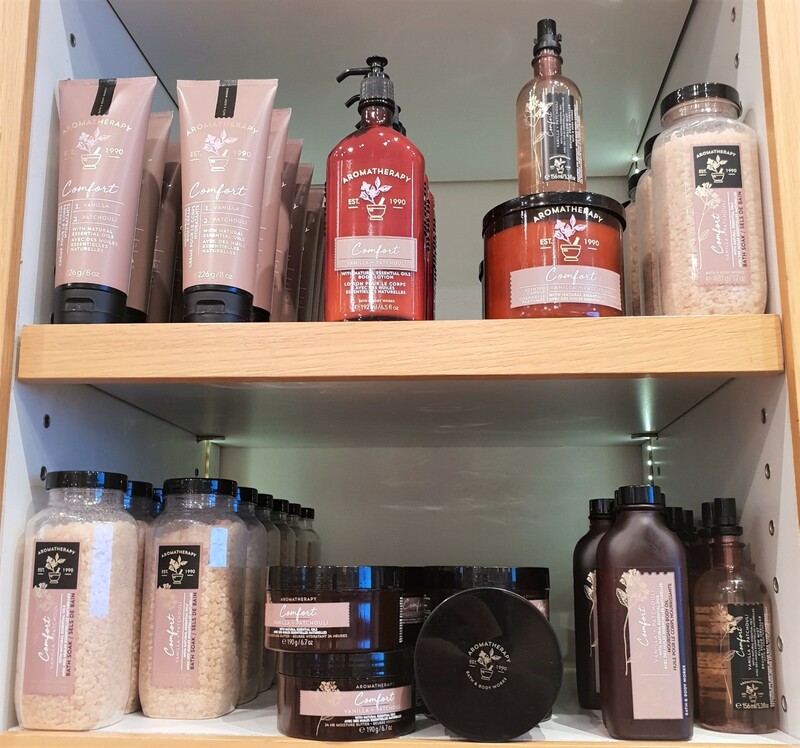 Our active skincare collection is made with the good stuff (Paraffin, Shea Butter & Vitamin E). Foot Fix Glycolic Acid Peel – Take a stand for active feet. This hard-working glycolic acid peel helps smooth dry, rough patches and cracked skin. Skin feels softer with every use. 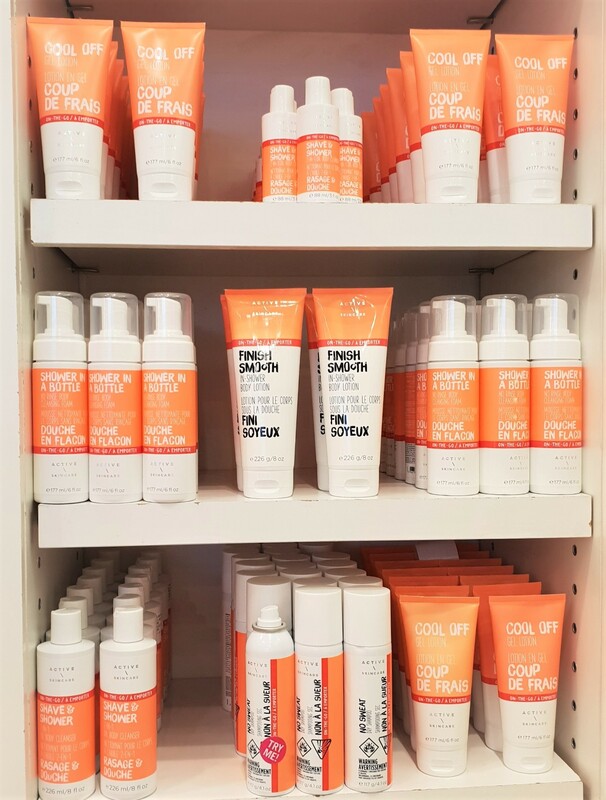 Our active skincare collection is made with the good stuff (glycolic acid & shea butter). Hit Restart Activated Charcoal Gel Cleanser – Give your skin a fresh start. This activated charcoal gel cleanser gently buffs and clarifies skin to help remove dirt, oil, and impurities. 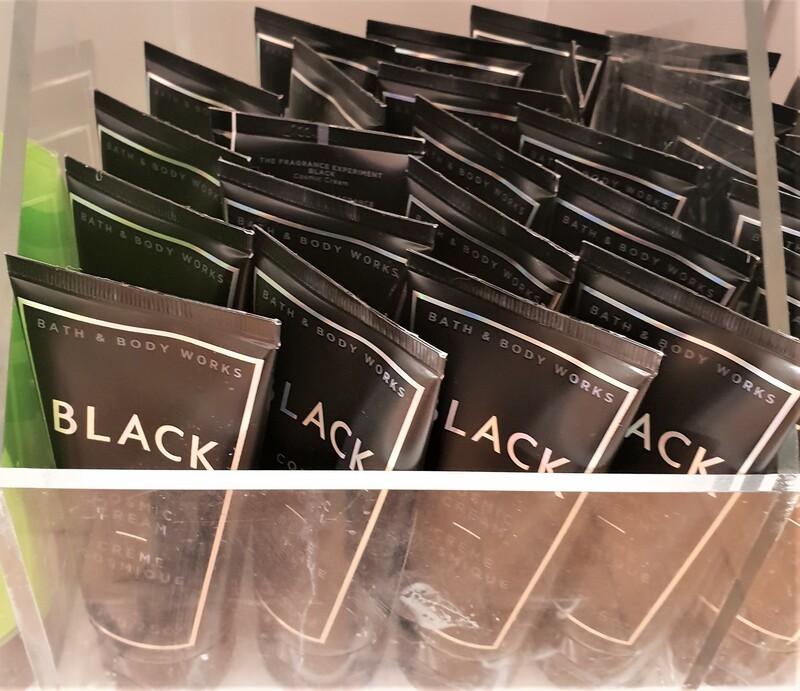 Detox Rocks Activated Charcoal Body Scrub – For diamonds in the rough. This purifying body scrub with activated charcoal and detoxifying white clay exfoliates to reveal clean, clear skin. I saw these during my trip to the Mishref branch (here), but as a rule of thumb, I don’t do florals. That said, now that I’m reading the notes, Chamomile & Honey (I love, love, love Honeysuckle!) seems promising so I just might go back and give it a sniff. 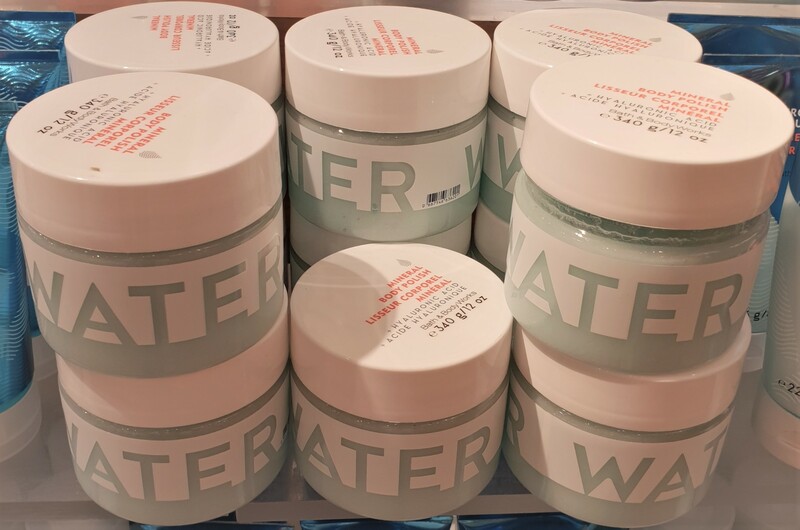 I kinda’ hauled quite a few things from both the Sea-tox and Water Collections (here), so I felt like I didn’t need to purchase anymore (even though I was open to it lol). 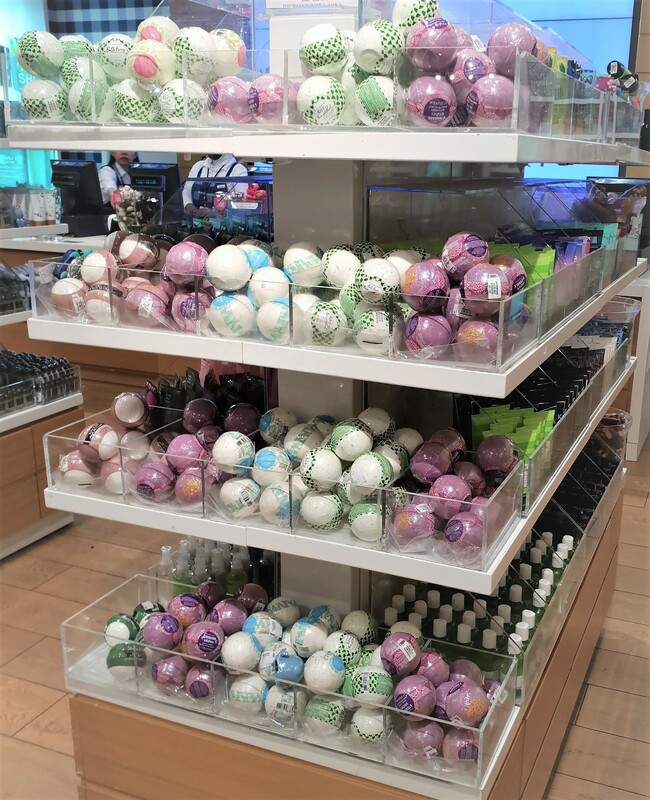 … But they even had the travel-size versions! 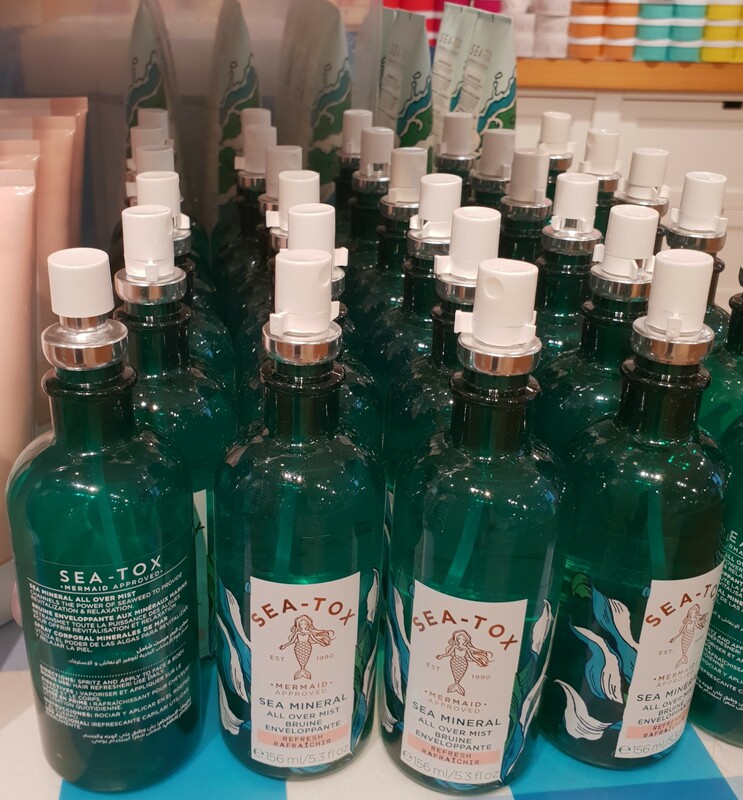 I asked the Sales Assistant why was it so familiar and he said the smell of Sea-Tox was basically Ocean (from the Men’s range). How stinkin’ cuuuuute! 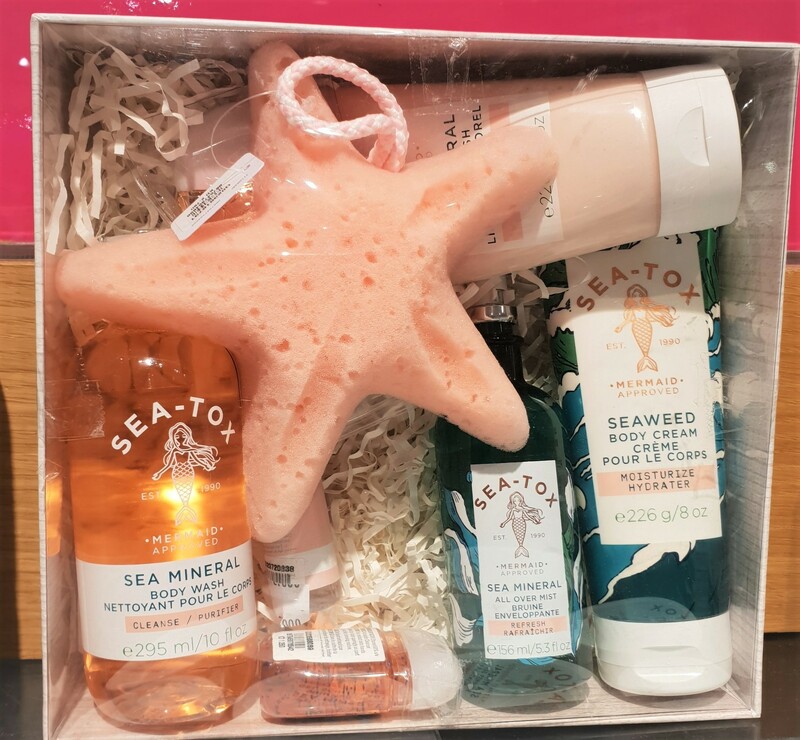 If I hadn’t already purchased these individually (here), I totally would’ve picked this up, just for the cute starfish sponge! This would make such a cute gift for your daughter or sister or wife or basically any woman with a pulse! 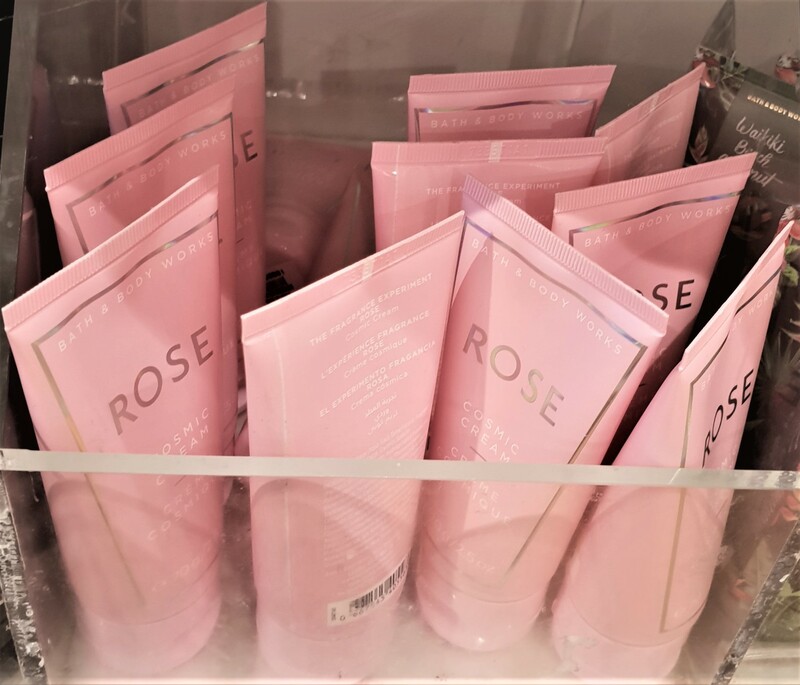 Unless they like fragrant florals… in which case, I don’t know, because Sea-Tox has a fresh unisex (read: masculine) scent so make sure the recipient is down for that. So pretty, right? I just wish they tasted better because these All-Over Face Mists keep getting in my mouth. 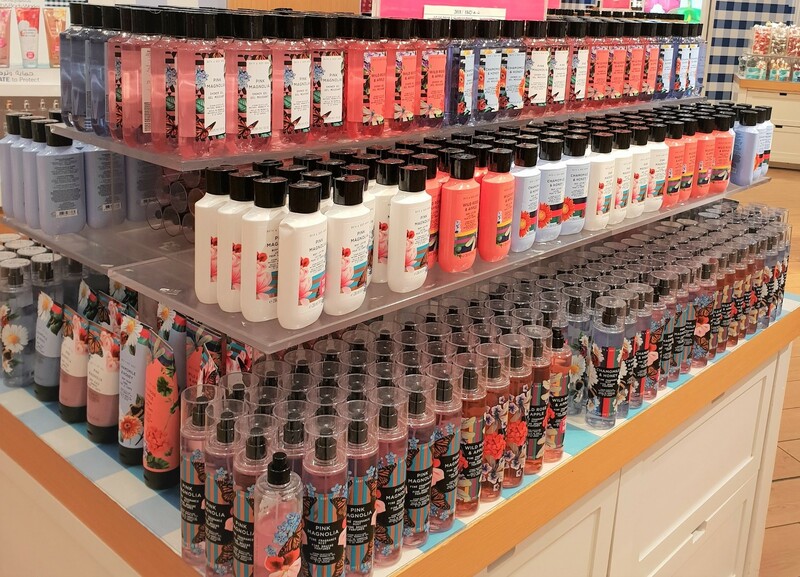 One of my favorite Bath & Body Works Collections, honestly! I don’t have a lot of favorites, but they just happen to seem like a lot, because most of them are available for purchase at the moment. 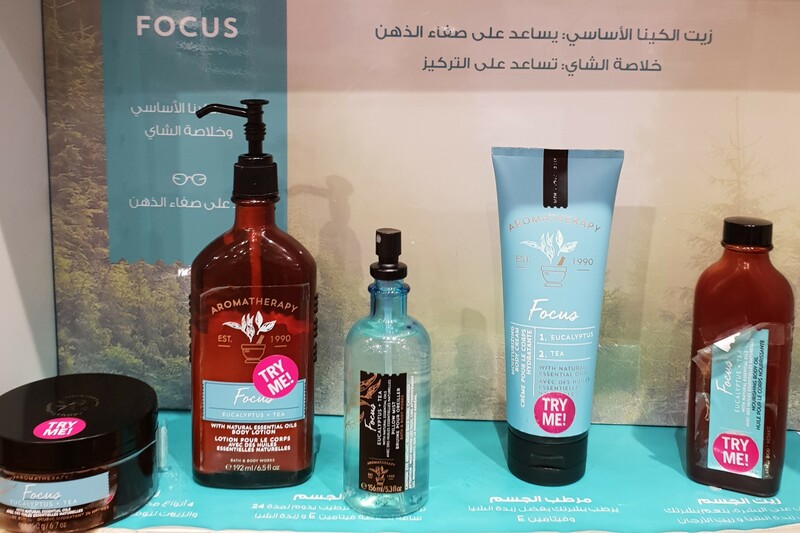 You guys need to try the Water Mineral Body Polish (haulage here)! If you buy just one thing from the entire collection, make it this one! Finally, some Wallflowers! These retail for KD 1/750 each. Whereas these retail for KD1 each. I purchased x3 Vanilla Bean Room Spray (haulage here), but gave them out to people (surprisingly, all men) who fell in love with the scent (my brother, my male cousin, my guy friend) and went out to get more (didn’t blog it) and they were promptly taken off my hands just as fast (also all by dudes). They’re constantly asking me to get more and I’m like “Guys, it’s not there anymore and I don’t know if they’re ever going to restock them or if it was just Limited Edition thing. 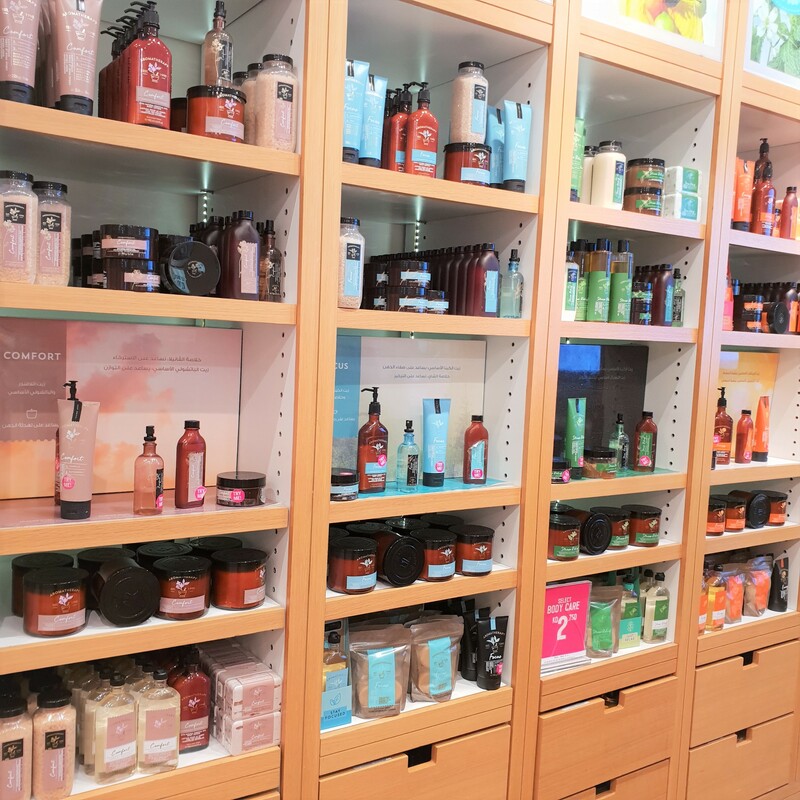 I don’t work at Bath & Body Works”. They’d reluctantly agree and go all “fine, fine” and then a few weeks later, ask me to get the “vanilla thing”… again. That’s why I was hoping I’d find the Vanilla Bean Room Spray, but no such luck. 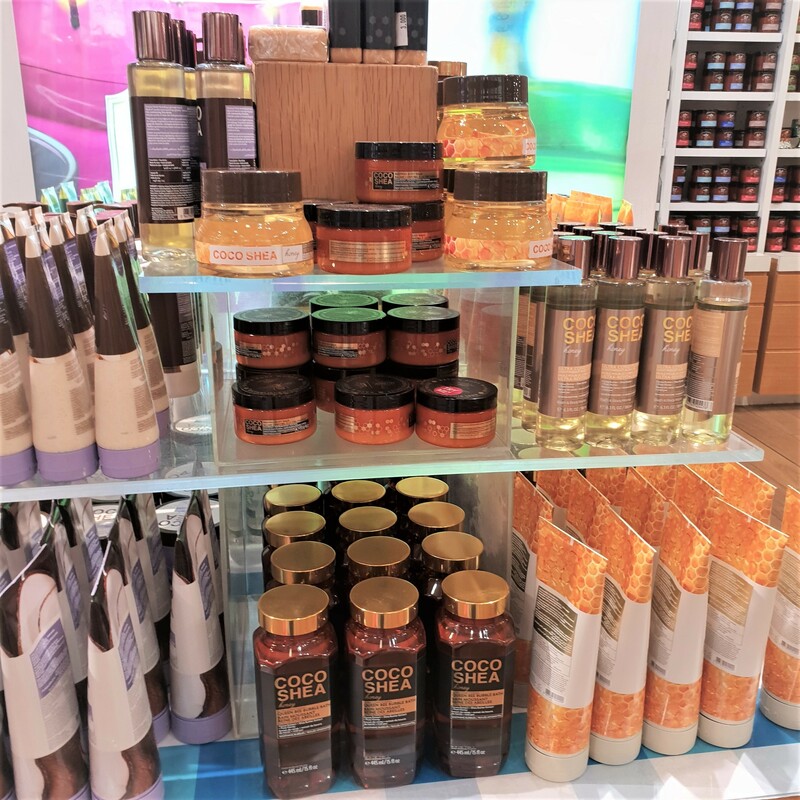 I spotted The Greatest Glow Collection earlier and thought it was pretty fun! 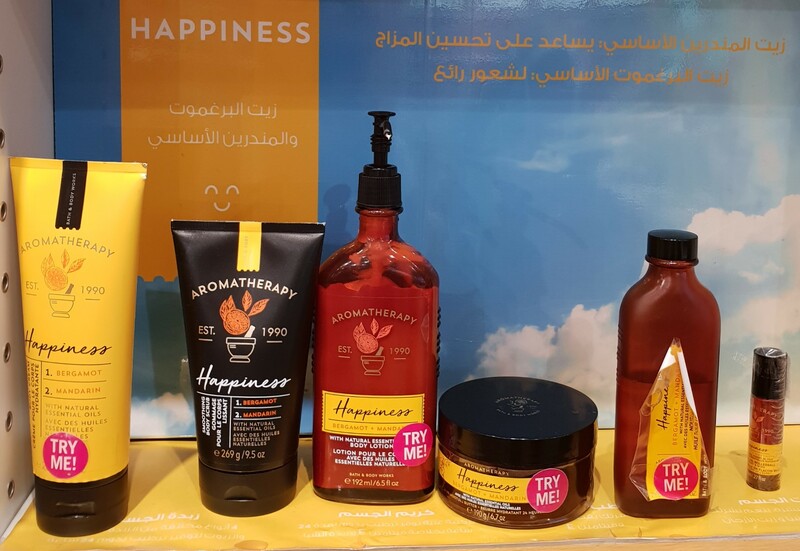 From the packaging to the actual products and their names and everything! It kinda’ made me think of a legit Carnival (or… The Greatest Showman lol) and figured I’d just go back later, but when I did, the collection had already been phased out (aside from the few minis you see here). 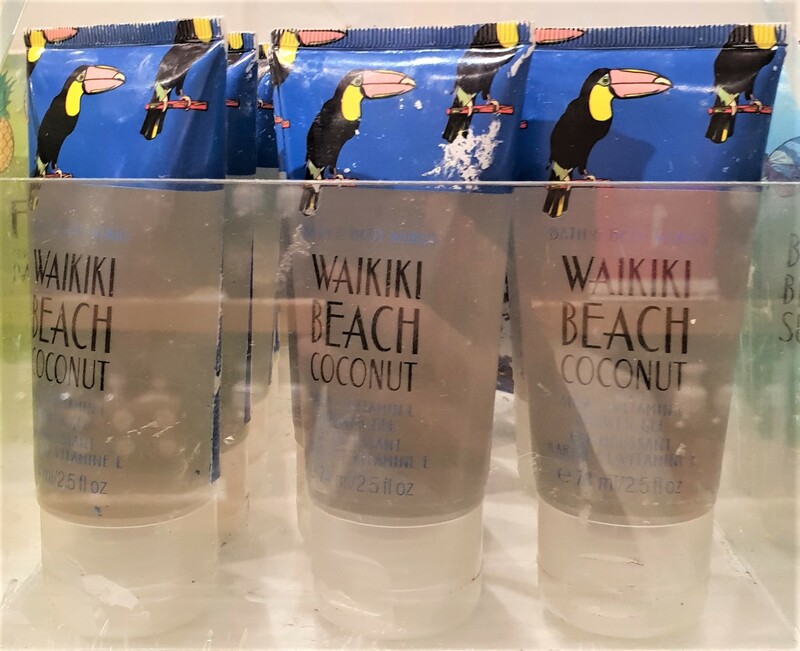 I purchased a Waikiki Beach Coconut Shower Gel Mini earlier (here). It was alright. 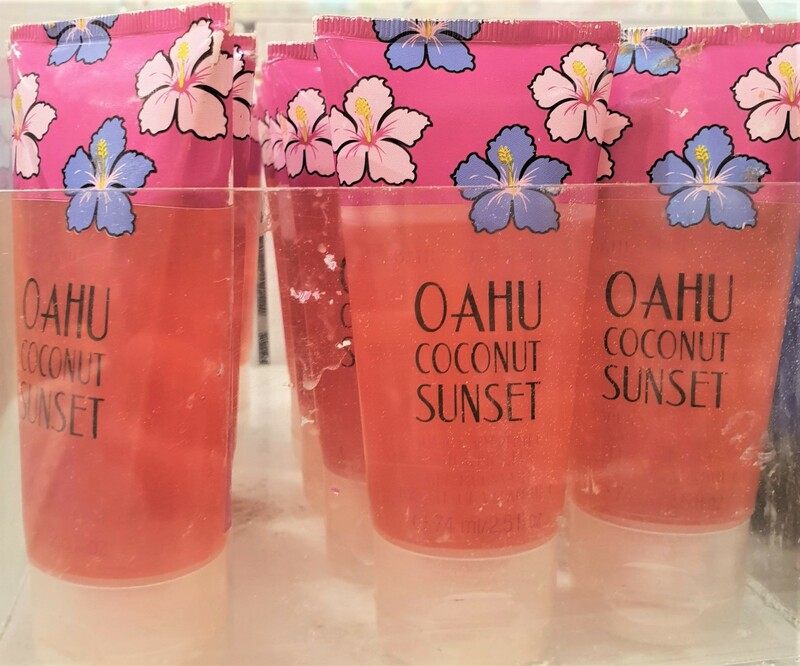 I purchased a Oahu Coconut Sunset Shower Gel Mini earlier (here) and really loved it (even took it with me on vacation)! I had to get at least one of these! So, I asked the Sales Assistants floating around to help me find an unopened one, or at least relatively decent one. Anyways, I figure what the Big Sale coming up soon, you might maybe find this post helpful!